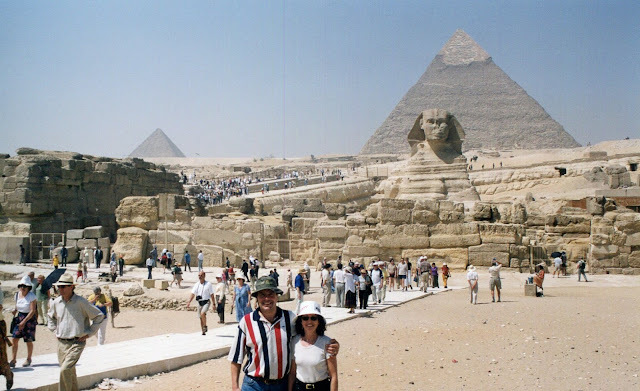 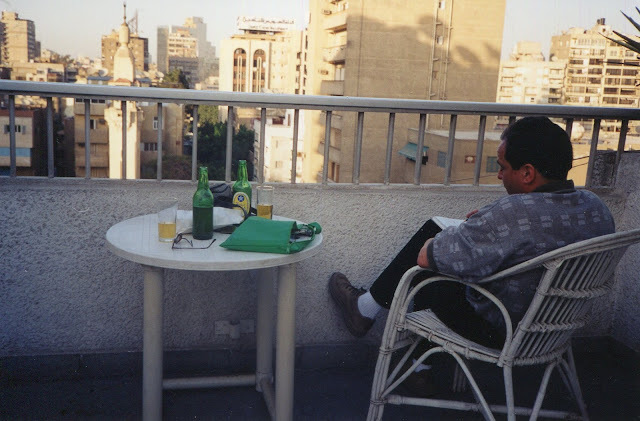 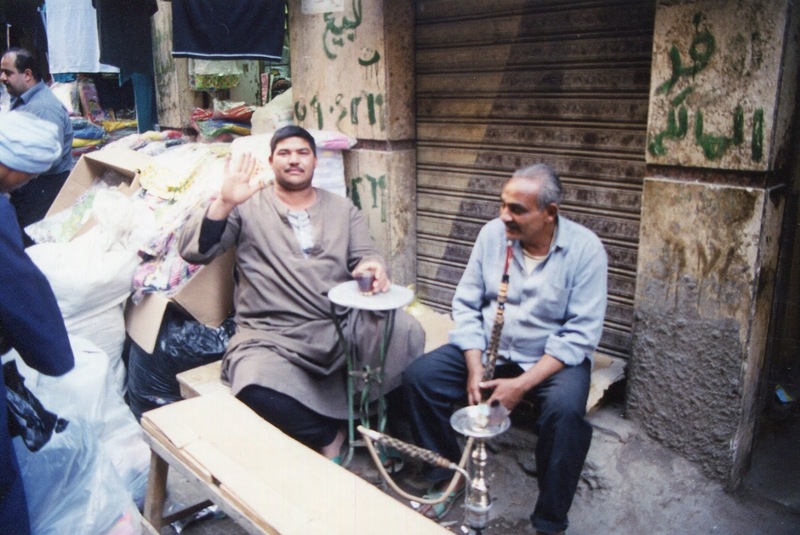 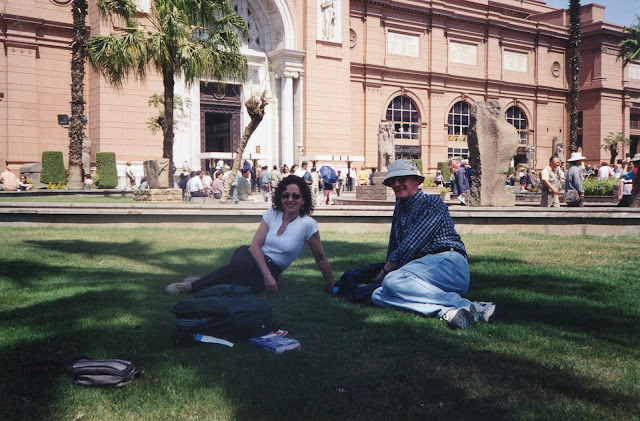 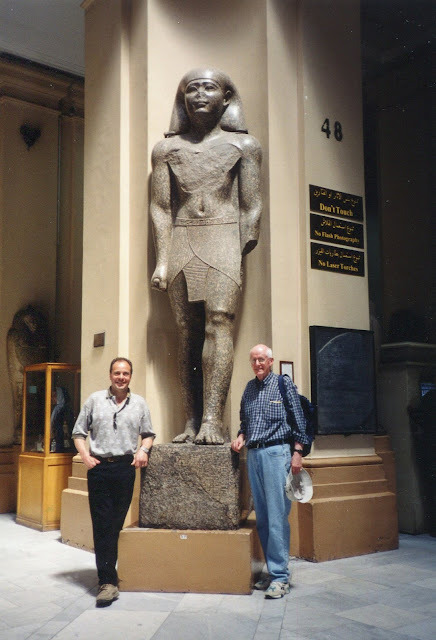 We arrived in Cairo after midnight and, after buying our visas from the currency traders, stood in interminable lines to get our passports stamped by bored but determined immigration officials. 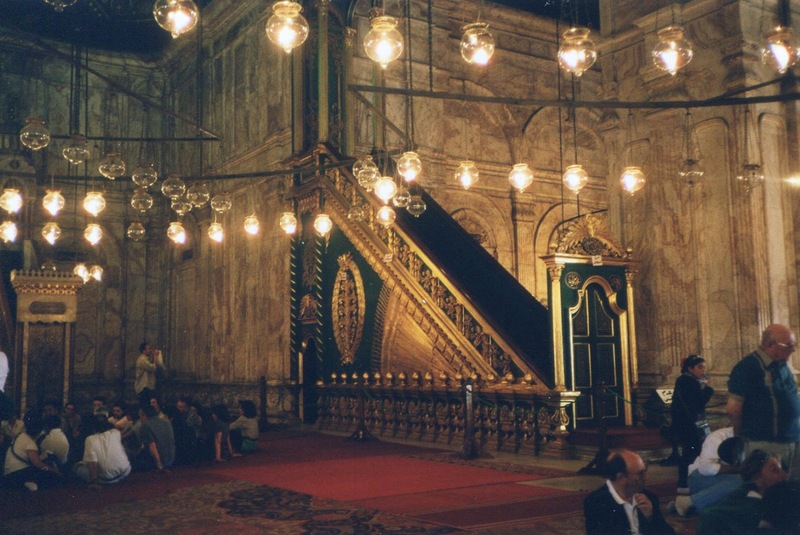 As tired as we were the next morning, there was to be no sleeping in once the muezzins started bellowing out the call to prayer, somewhere around 4:30 A.M., throughout the city from loudspeakers mounted on top of the minarets. As we were to soon discover, these minarets, being the principal feature of every mosque, would be the most common sight everywhere we went. 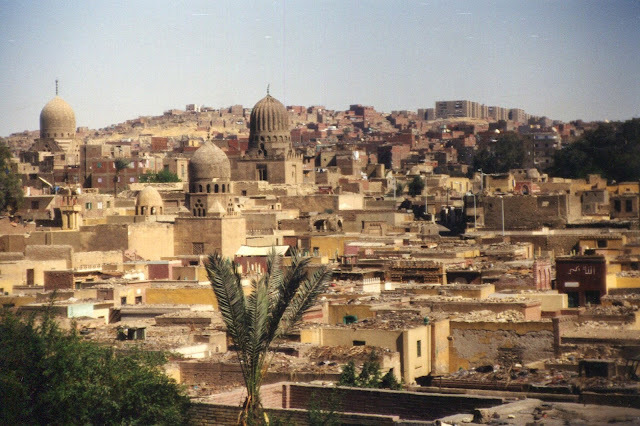 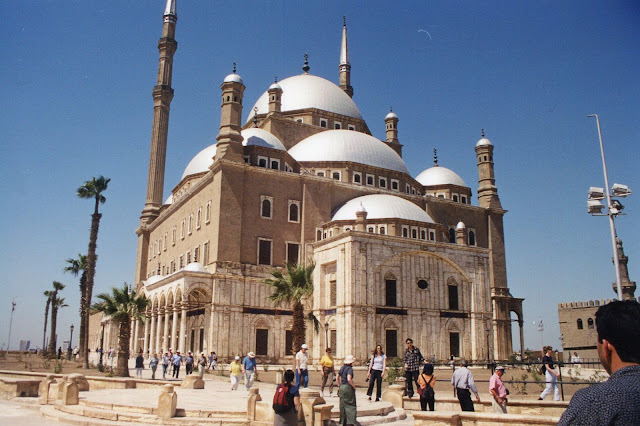 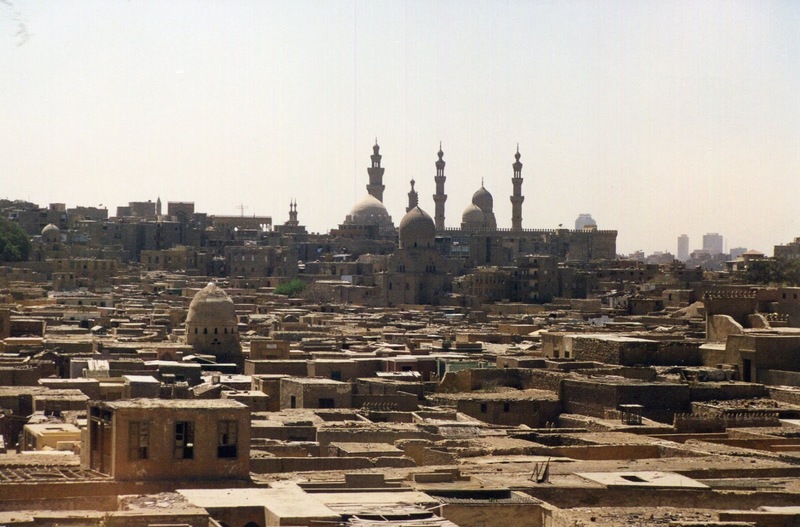 In Cairo alone there are thousands of mosques, but we had come here specifically to check out the most famous temples and tombs of the world so we quickly got used to the idea of a mosque being almost everywhere we turned. 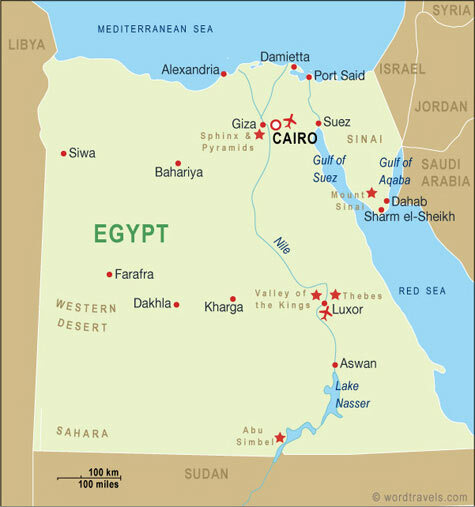 With more than 16 million people, Cairo is one of the largest cities in the world, and second only to Mexico City in terms of being the most polluted urban center. More than a million poorly maintained vehicles, using leaded fuel, jam the impossibly crowded streets, spewing noxious fumes into the air, while maintaining an incessant cacophony of noise thanks to the national pastime of compulsive horn honking. 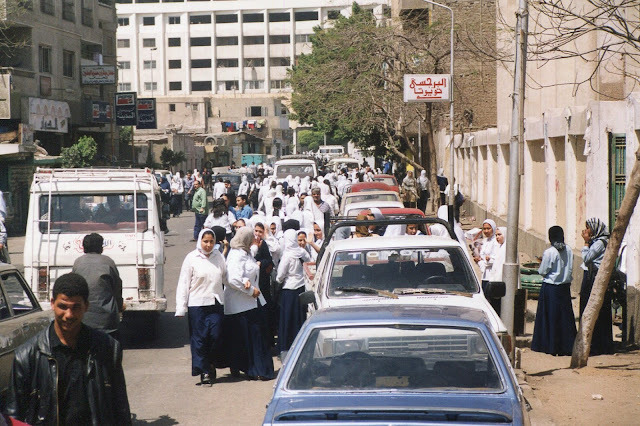 Air pollution from all the buses, cars trucks, and nearby factories is 10-20 times higher than internationally accepted limits, and in a day your eyes are burning. 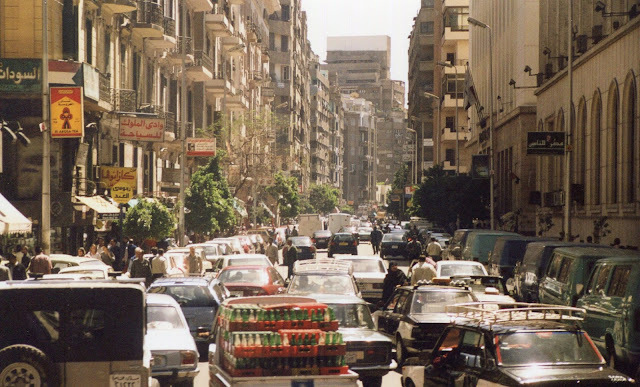 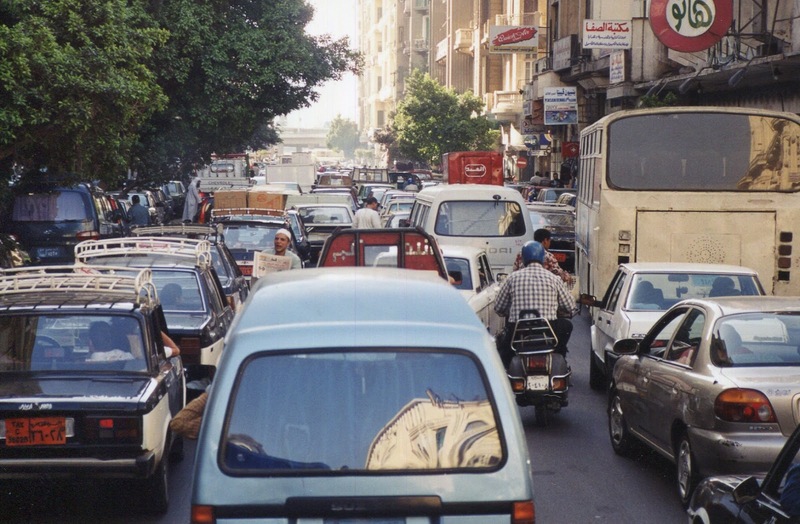 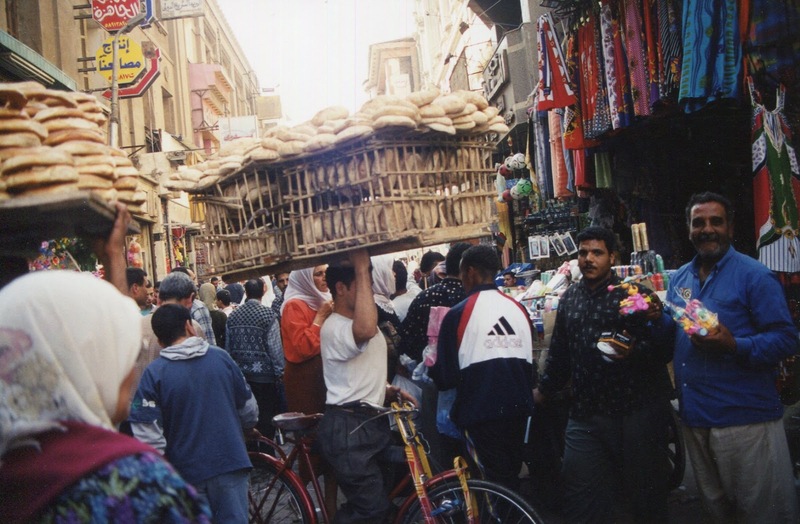 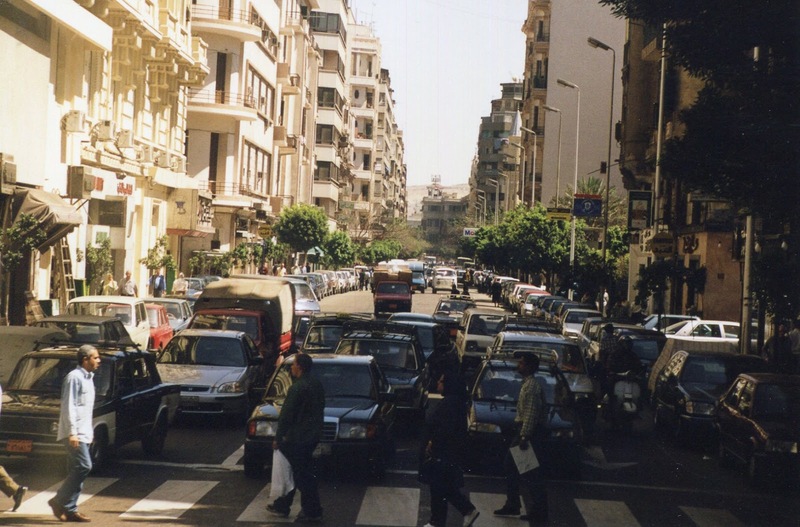 Cairo is also the most densely populated city in the world, but it can’t even begin to cope with building and/or maintaining the necessary infrastructure for its overcrowded population. 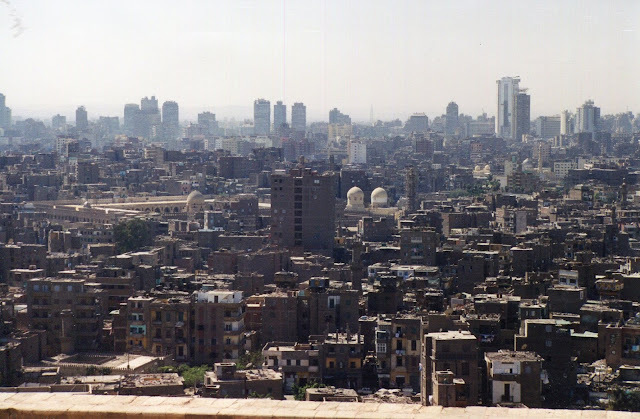 The entire city is a work-in-progress with massive, poorly constructed and half finished housing developments appearing everywhere. In spite of these urban problems, the city has many fascinating attractions. 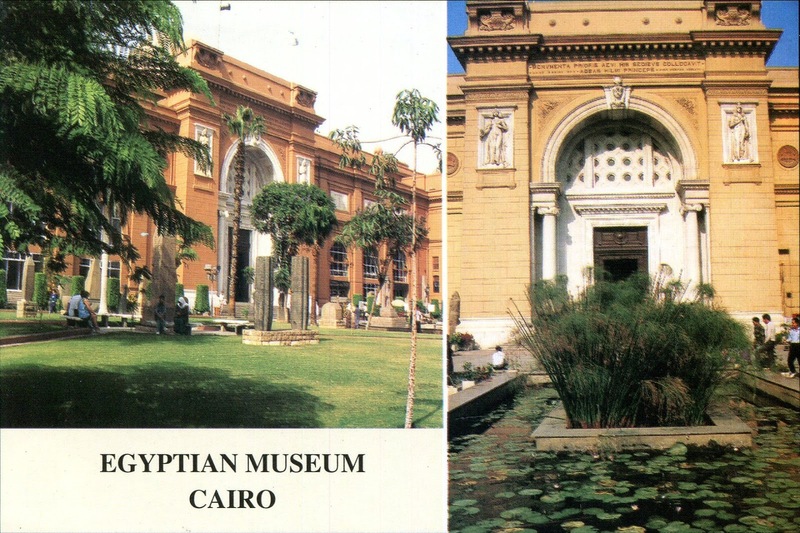 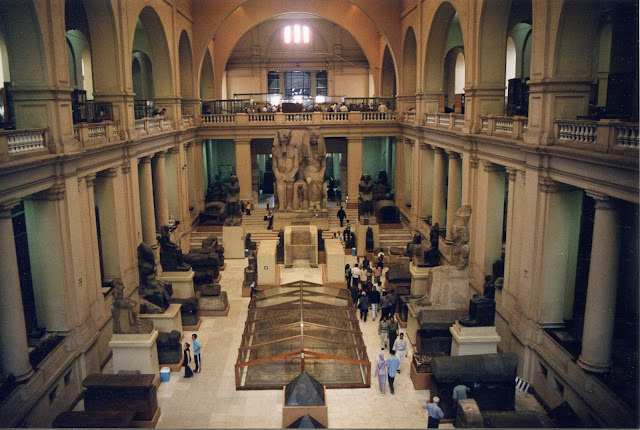 First and foremost, is the Egyptian Museum, a building bursting with ancient jewellery, artifacts, statues, mummies, sarcophagi and caskets. 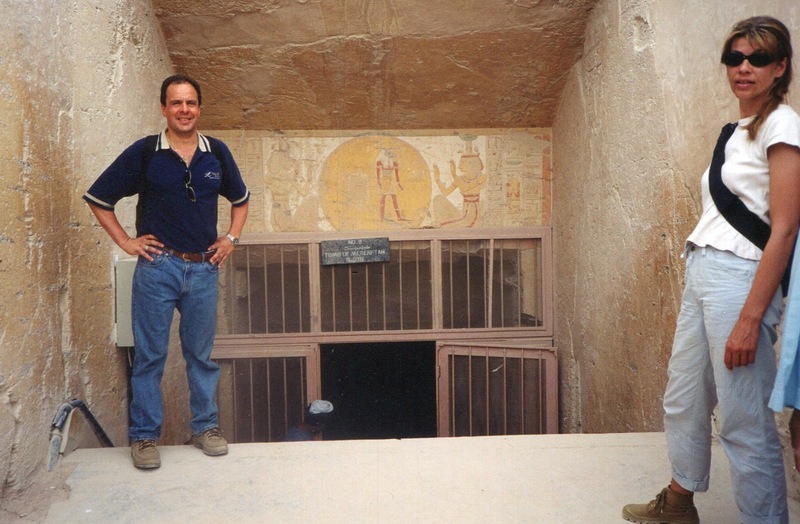 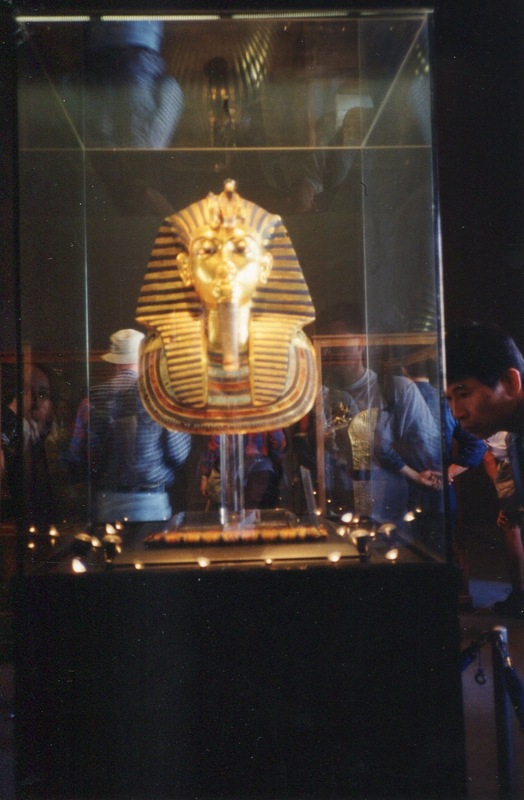 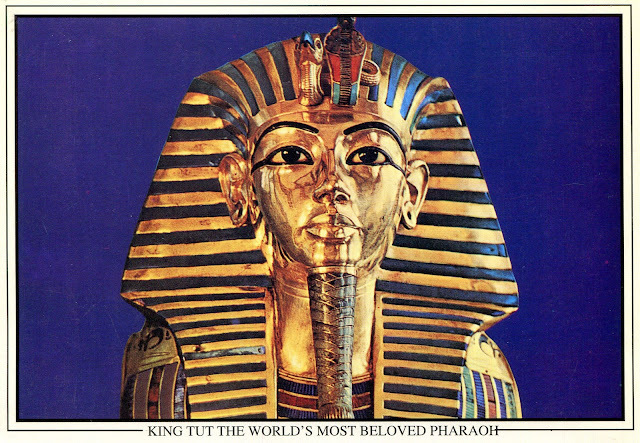 It’s in this museum where all the articles from the tomb King Tutankhamun can be found. He was a very minor pharaoh whose grave was somehow missed by robbers, and although the contents are nearly enough to fill the museum on their own, one can only imagine what the tomb of someone like Ramses 2 would have contained. 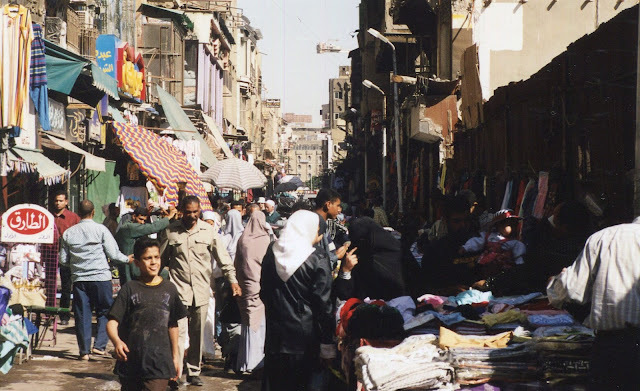 Another colourful sight is the Khan Al-Khalili bazaar. 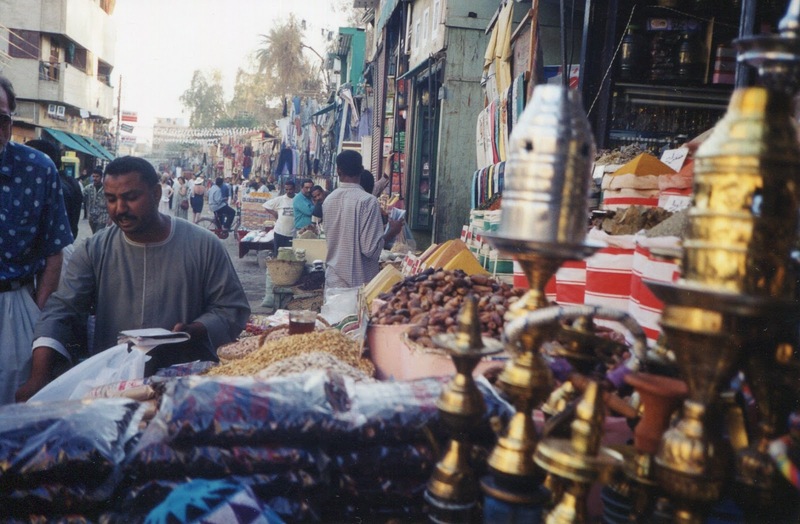 Here one can wander amongst the countless vendors jammed side by side and all promising the best bargains on everything from nuts to t-shirts. 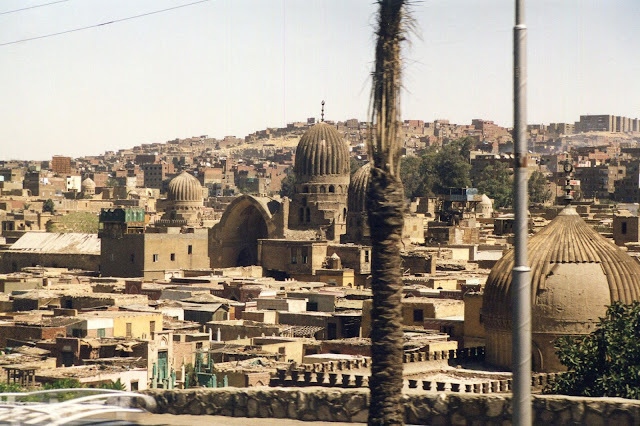 There is also the fascinating city of the dead, a vast cemetery complex filled with tombs complete with electricity and running water. 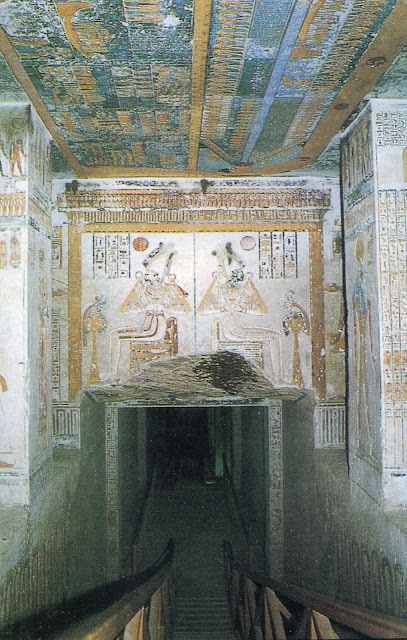 Ancient Egyptian tradition encouraged the practice of entertaining and picnicking among the tombs, which also have rooms for guests to sleep. The poor and homeless have now moved into the cemeteries, keeping them clean and in good repair, and living there in a bizarre sort of symbiotic relationship between the living and the dead. As long as one is appropriately dressed, and shoes are removed upon entry, anyone is welcome to step inside a mosque, one of the most magnificent being the beautiful Mohammed Ali mosque situated on top of the Citadel. Here one can contemplate the 5 pillars of Islam, admire the work of the artisans who decorated its interior, and enjoy a moment’s respite from the heat outside. 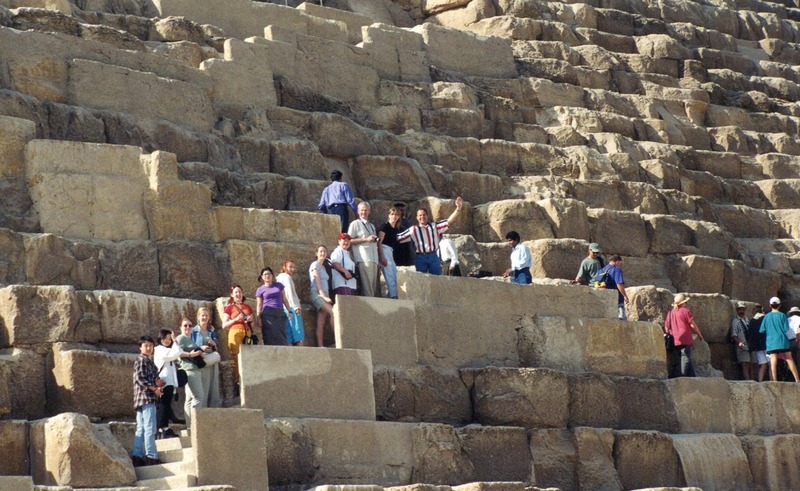 From its various terraces it also provides a spectacular view of the city that stretches all the way to the Pyramids. 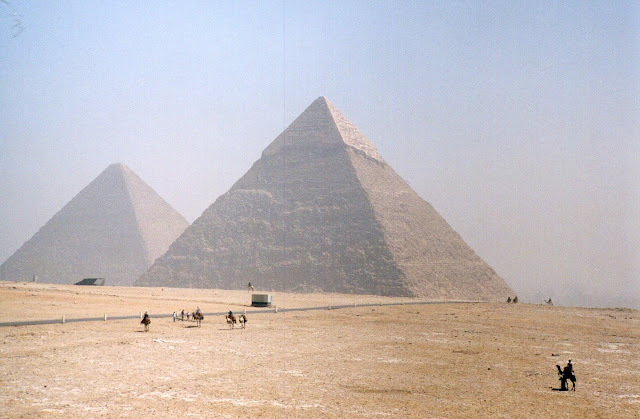 The Pyramids of course, are the first image everyone has of Egypt and, as the only remaining one of the “seven wonders of the ancient world”, it is perhaps its greatest attraction. 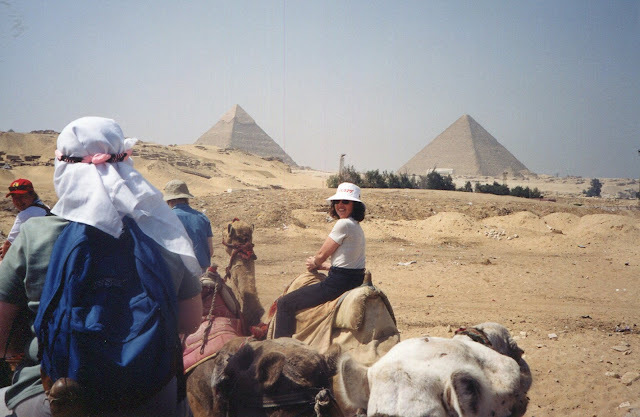 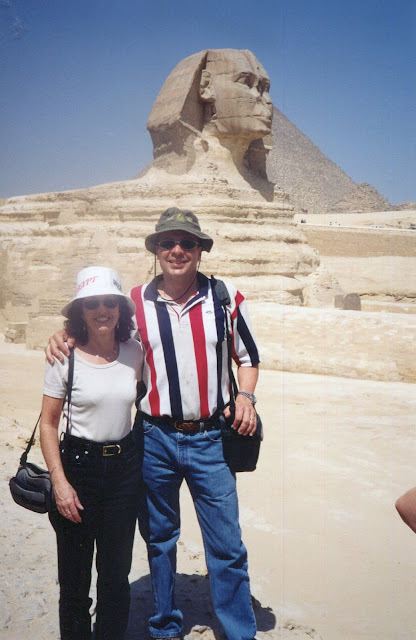 On our second day we mounted camels and headed into the Sahara desert to check out the Pyramids and the Sphinx. After all the movies and documentaries it still comes as a bit of a shock when you actually come face to face with one of the oldest structures in the world. 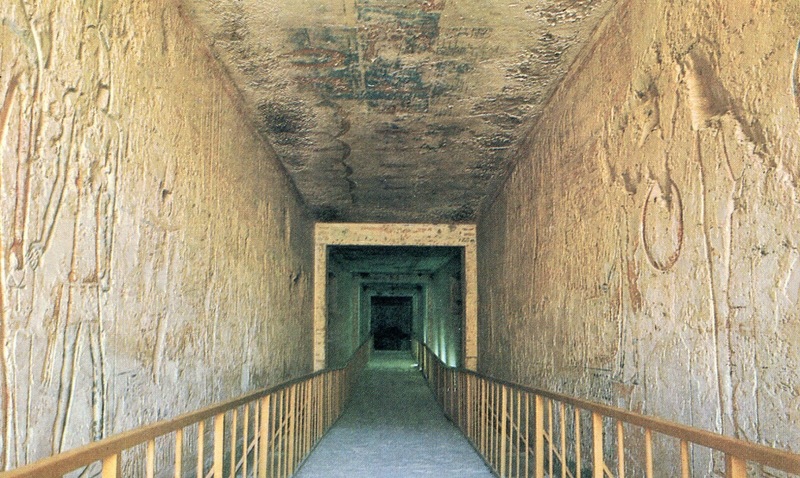 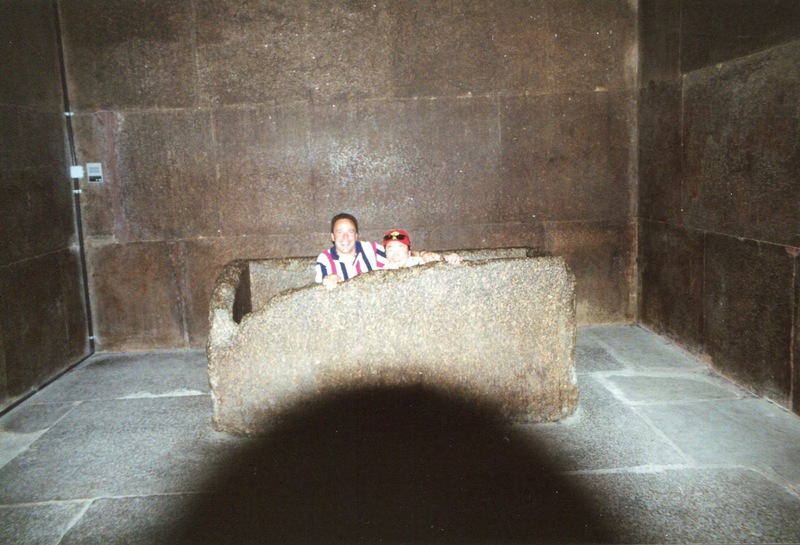 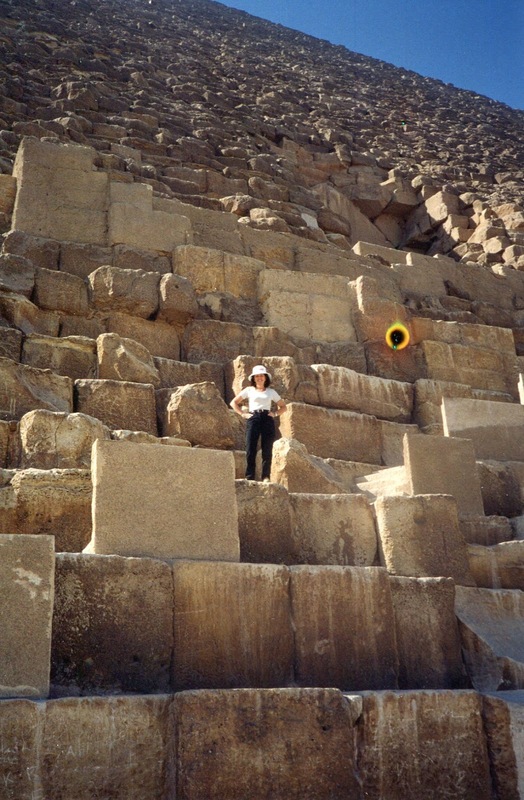 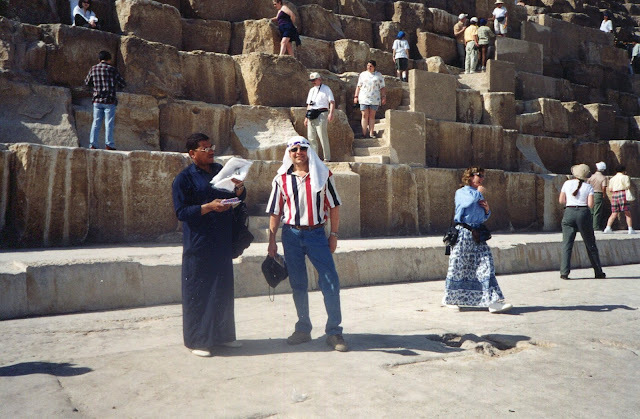 As we crawled through the chambers of the Pyramids it was hard to believe or appreciate, in this era of instant gratification, the planning and thinking that went into the construction and design of these amazing monuments for the afterlife in preparation for the supposed “day of judgment”. It’s also hard to imagine what time or timelessness really means until one is confronted with the man made evidence of 5,000 years. 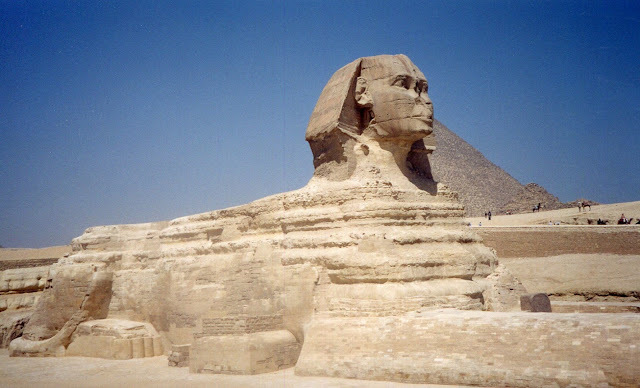 A narrator’s booming voice tells us the Sphinx sits there as guardian of the Pharaoh’s tombs, facing directly east to greet the sun as it has risen each and every day for the past 5,000 years; nearly 2 million sunrises. The sunrises in our own lifetime would be lucky to reach 30,000 and how many do we remember, never mind how many do we miss? 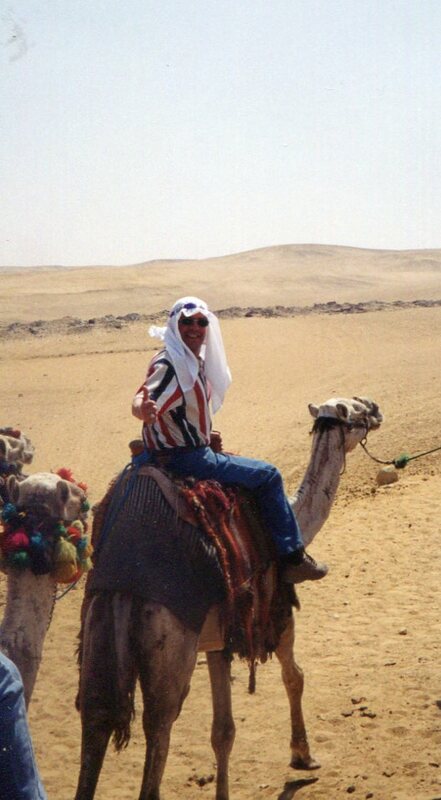 On the way back from the Pyramids I wanted to get away from our slow moving caravan, with all its rude noises and other goings on, and give my camel a chance to show me what a little camel racing would feel like. Accordingly the guide uttered some unintelligible command and instantly my beast was off and running. 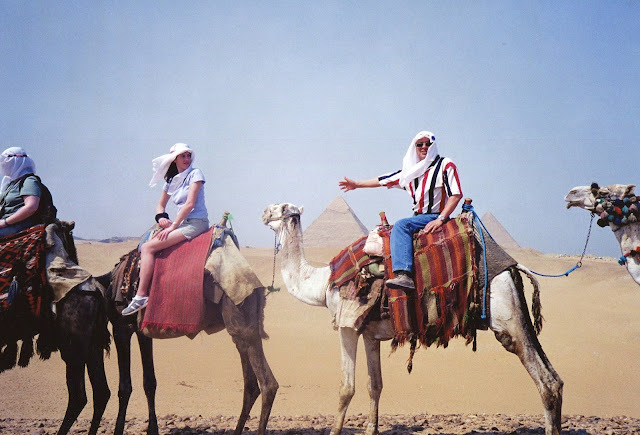 However, unlike a horse, a camel had a decidedly undulating type of wild gallop that makes it a little tougher hanging on until you get into the rhythm. 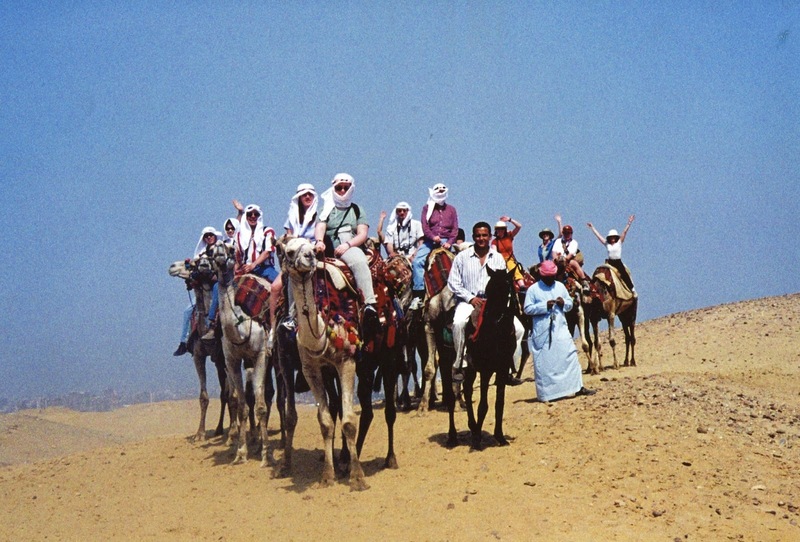 Nonetheless all was going well and I could hear the others in the background all cheering me on as I sped across the desert on my sure footed contender for the "Breeder's Cup". I could see the camel paddock starting to come into view when suddenly, without any warning, my ride collapsed onto his front legs and catapulted me through the air and over his head into the sand about 25 feet past where he lay down. 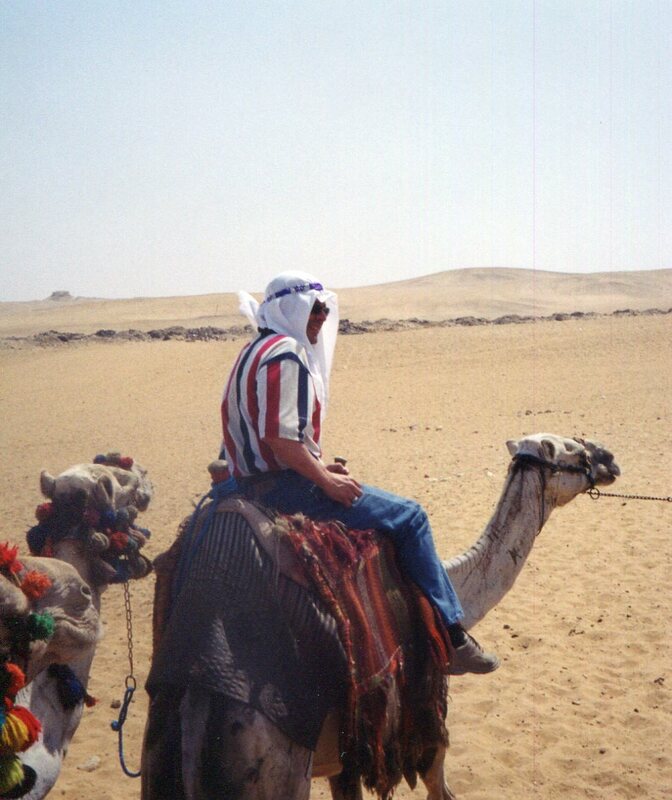 Picking myself up, while at the same time trying to get all the sand out of my mouth and face, I rushed back to my camel expecting to find him in agony with at least on leg broken, only to see that he was quietly resting as everyone else was arriving and shrieking with laughter at my spectacular flying demonstration. 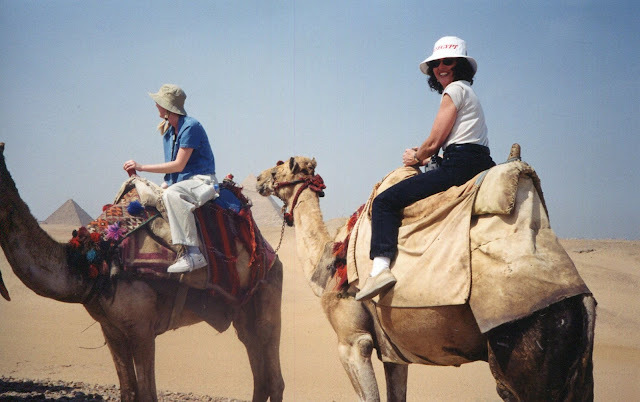 I had never bothered to learn the command for getting the camel to slow down and, being in a hurry like any animal on its way back to the barn after a hard day's work, nothing was going to stop it until it got there. 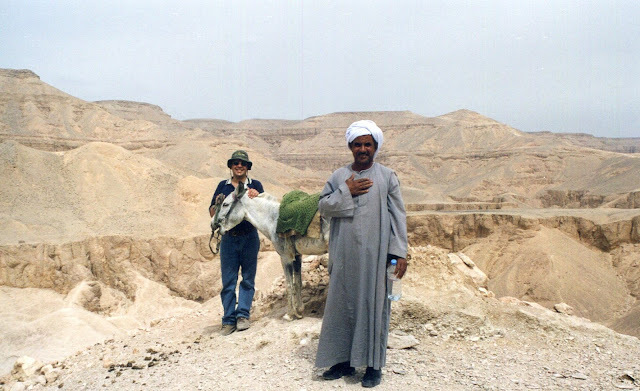 When a camel decides to stop it stops and, other than a little loss of dignity, I was thankful for having survived a rather rough landing. 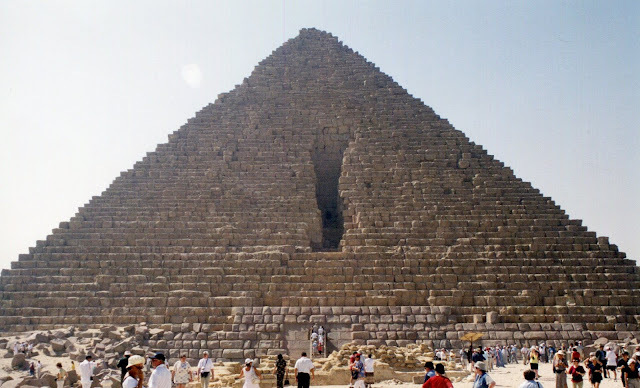 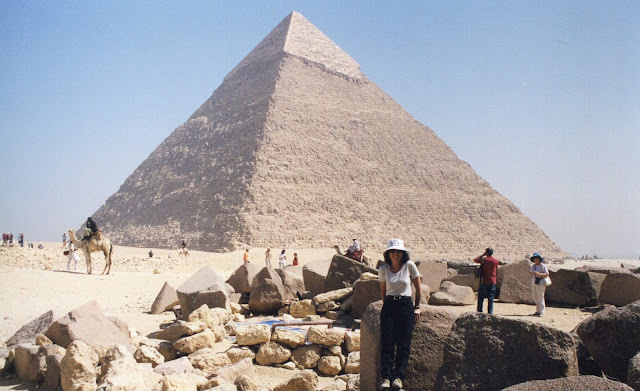 As spectacular as the Pyramids are they were only a prelude to the tombs of Egypt, and a country that, from the very start, has been very serious about its burial grounds. 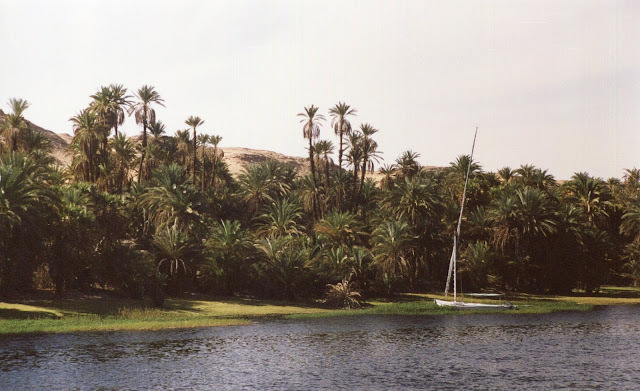 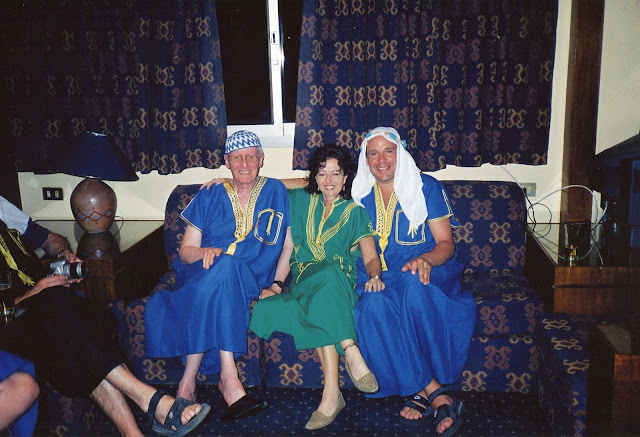 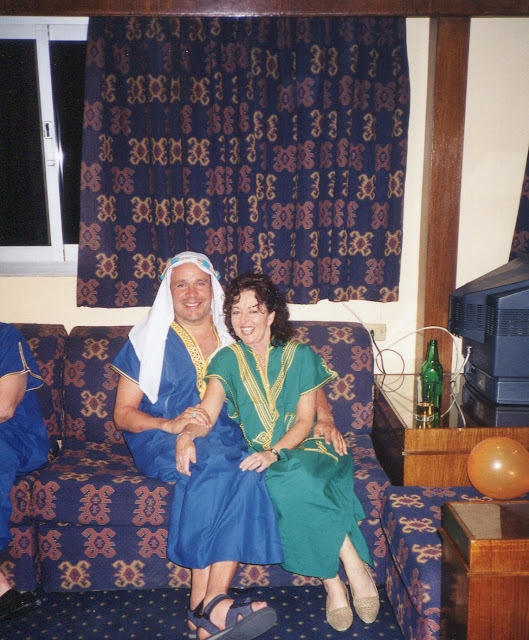 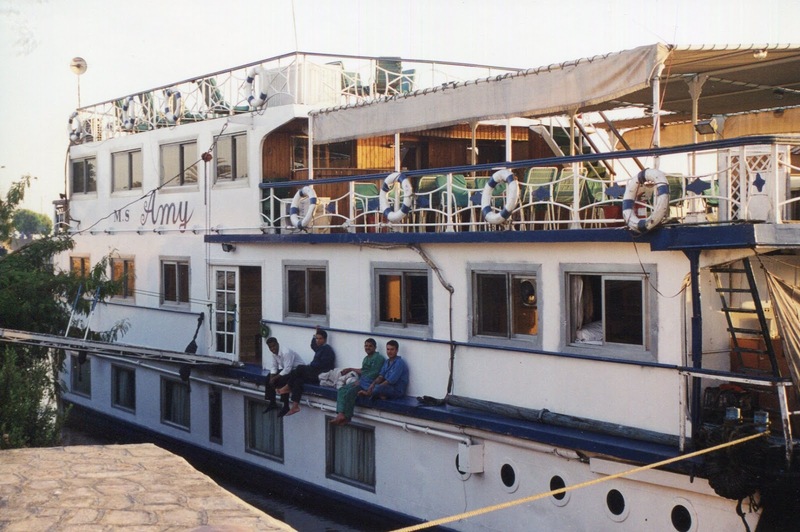 After three days in Cairo it was time to move into deeper, darker, and hotter Egypt so we boarded an overnight train to Aswan. 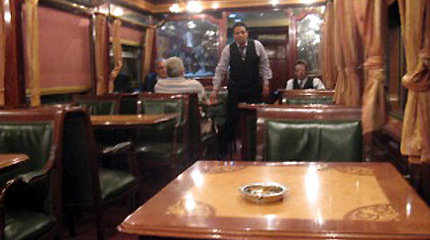 Fortunately the train was equipped with a club car where our little tour group could sit around drinking gin & tonics getting to know one another and pretending we were living in an earlier era. 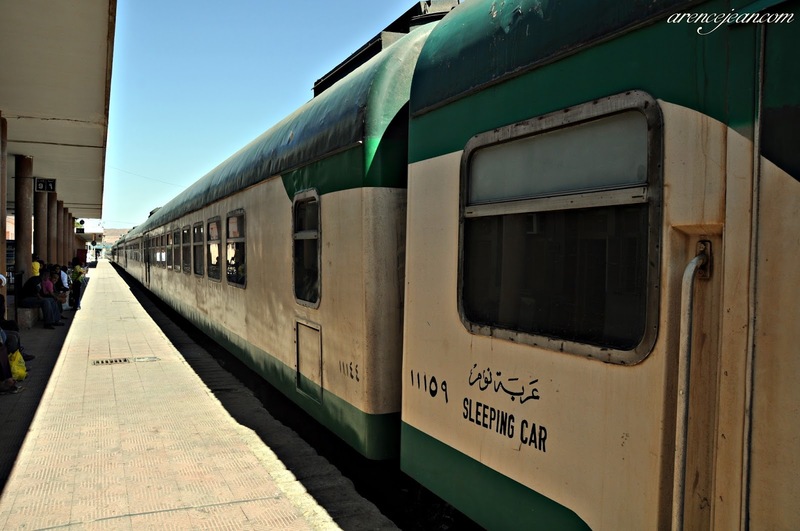 The pleasant click clicking rhythm of the train wheels, as they rode over the tracks, eventually lulled us to sleep until we awoke to another sunny day in Egypt this time in the city of Aswan. 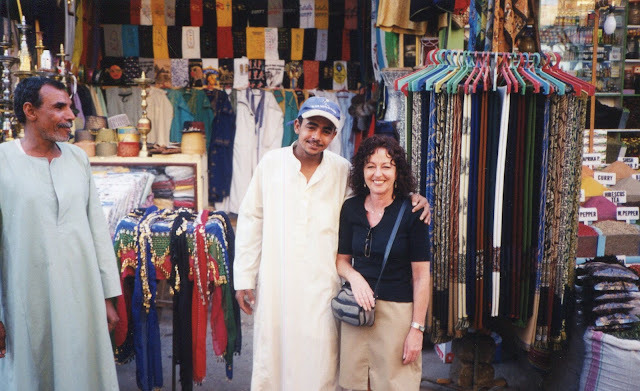 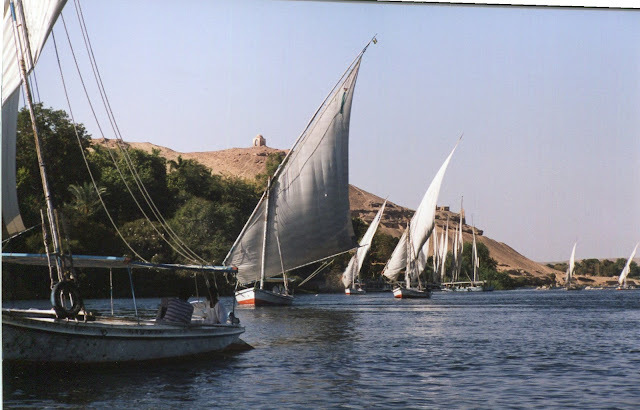 A delightful respite from the bustling chaos of Cairo, Aswan is a quiet little town on the Nile and the starting point of our river cruise. 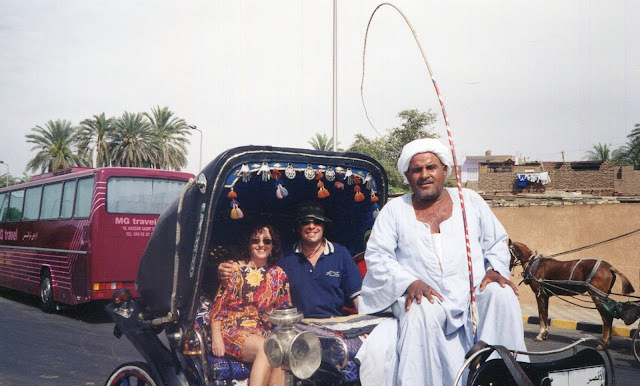 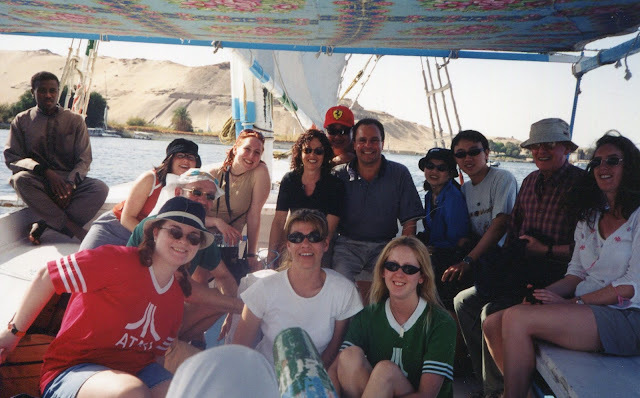 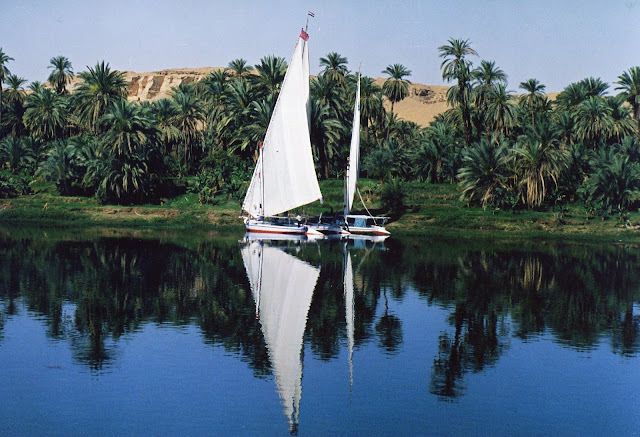 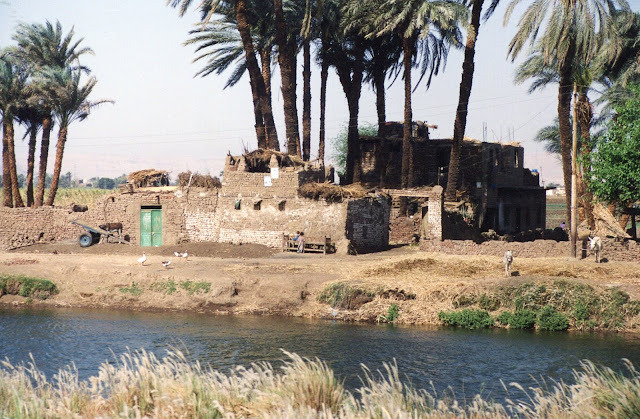 Before the cruise began we had a couple of days to explore the street bazaars, local temples and ancient ruins in the area, including the Philae Temple, and take a felucca for small sailing excursions on the river. 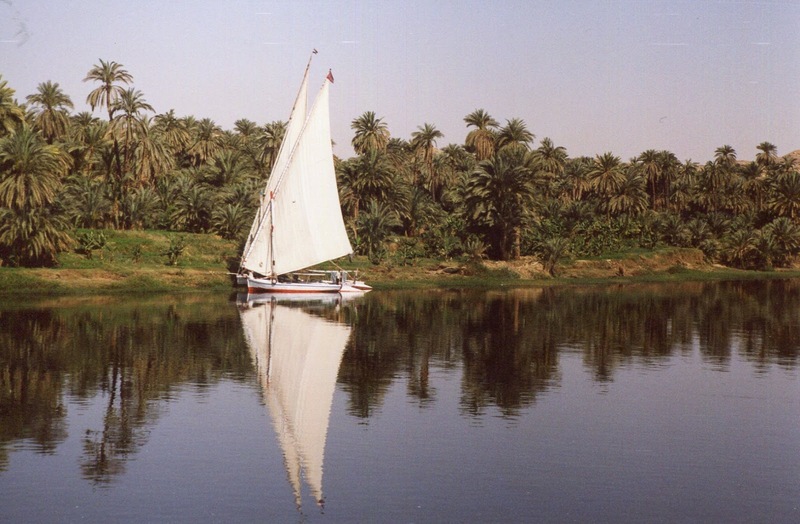 Junie, who up until now would have nothing to do with boats or water, seemed very content to cruise around on the Nile enjoying the sunshine, cool breeze and clean blue water. 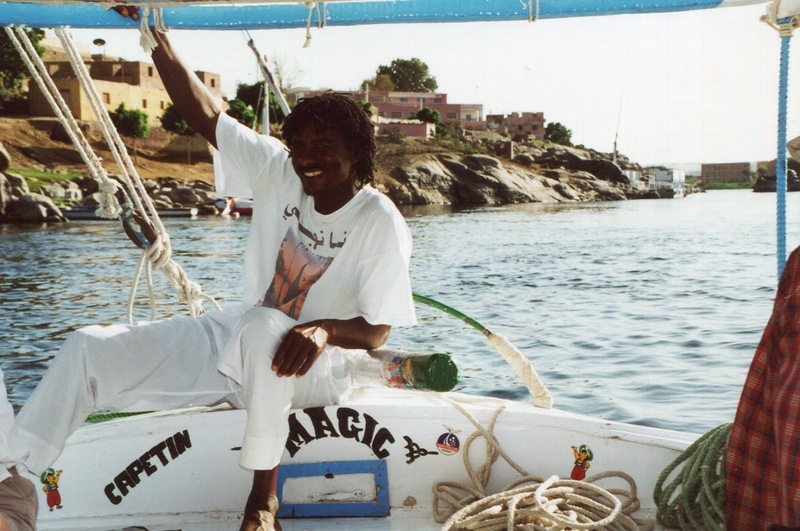 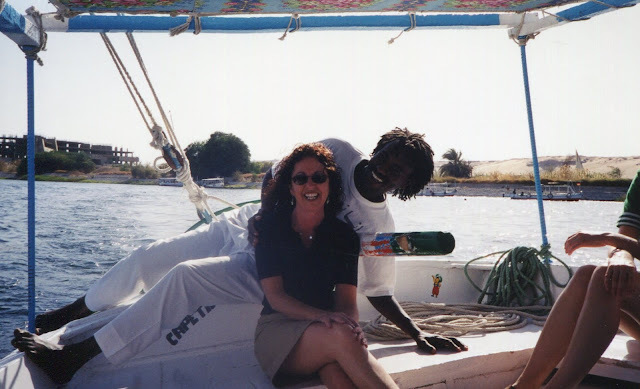 Of course it might also have had something to do with the strikingly handsome and skillful Nubian captain of the sailboat who made her forget about everything for awhile on those warm afternoons except her own pleasant fantasies. 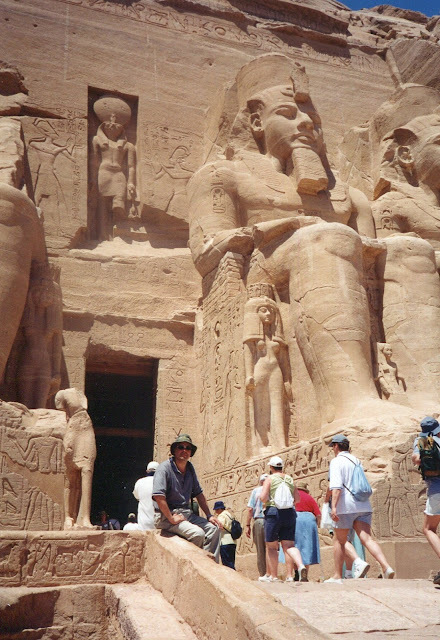 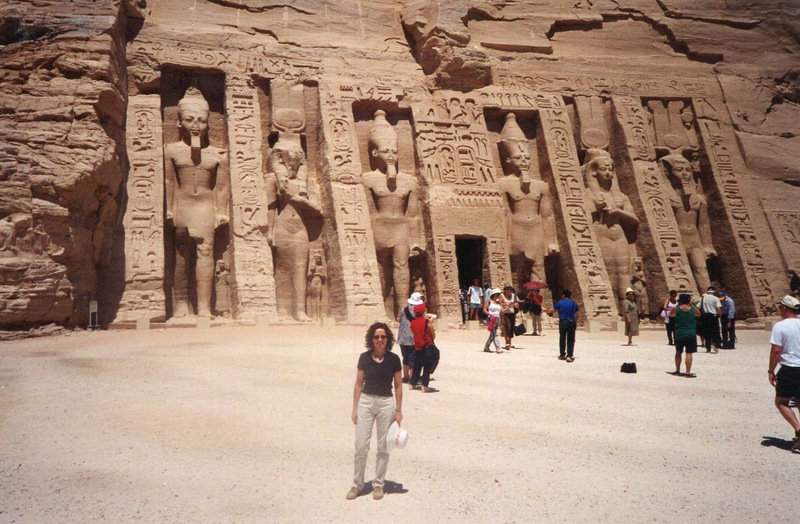 From Aswan we caught a flight south to Abu Simbel, site of the massive twin temples Ramses 2 had built for himself and his wife Queen Nefertari. 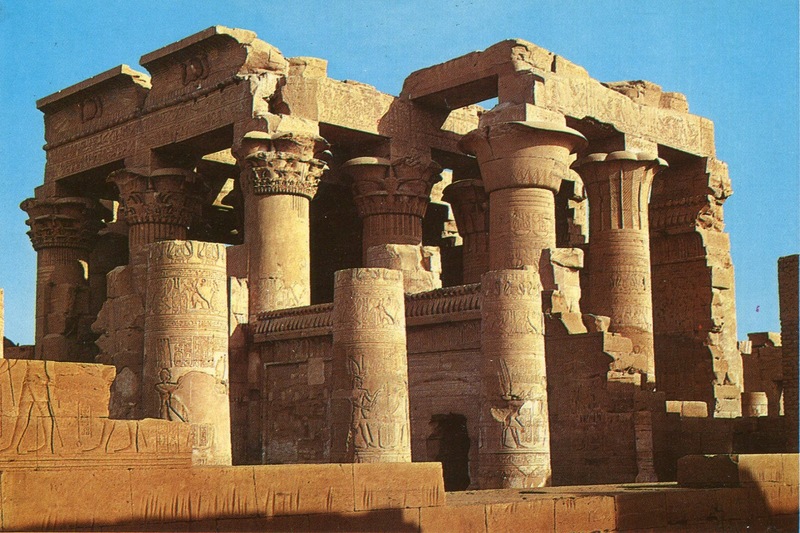 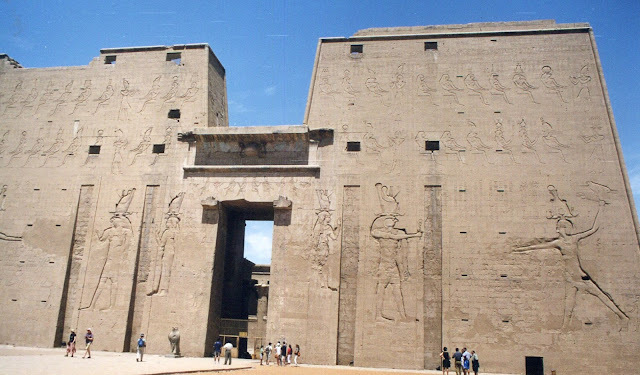 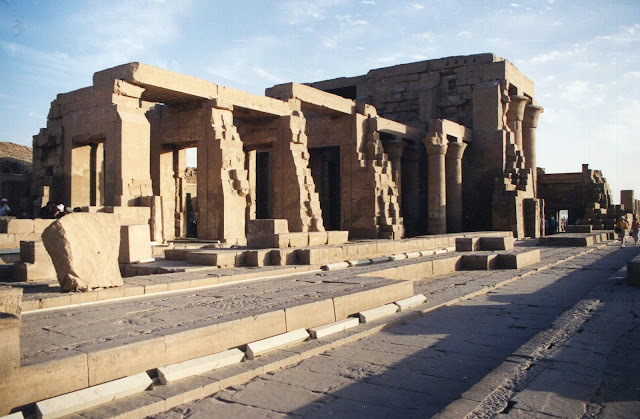 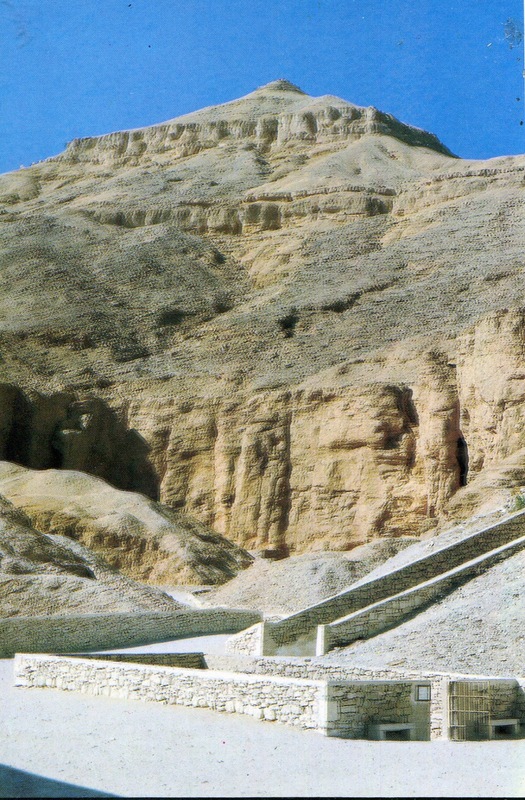 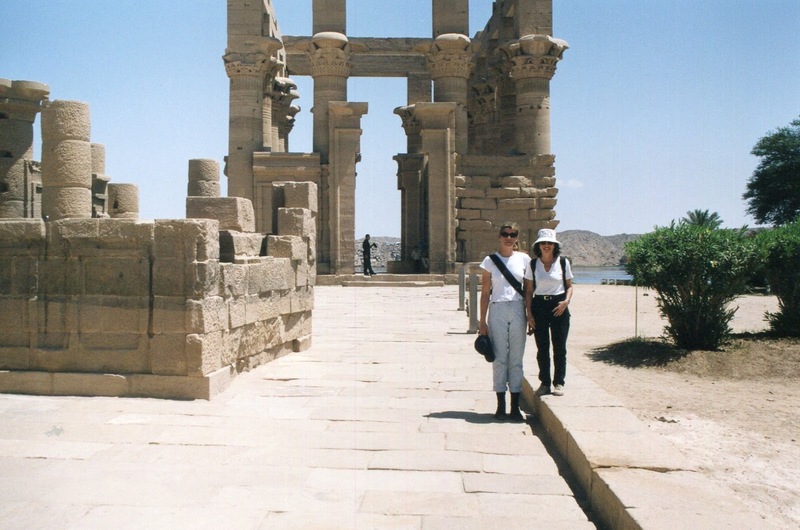 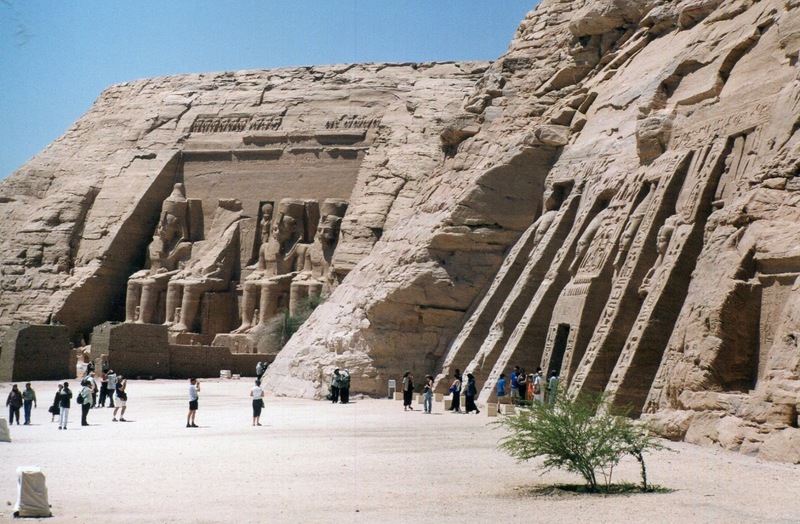 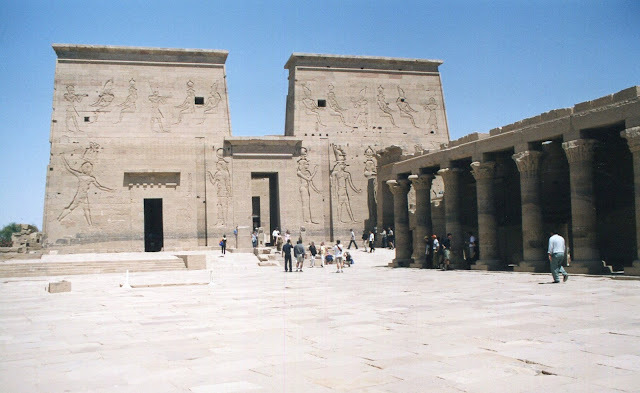 It’s hard to decide which is more impressive, the actual temples themselves, carved out of the mountain or the massive U.N. rescue effort that had them cut into 2,000 blocks weighing 10-40 tons each and transplanted to a specially built site above the flood level of Lake Nasser. 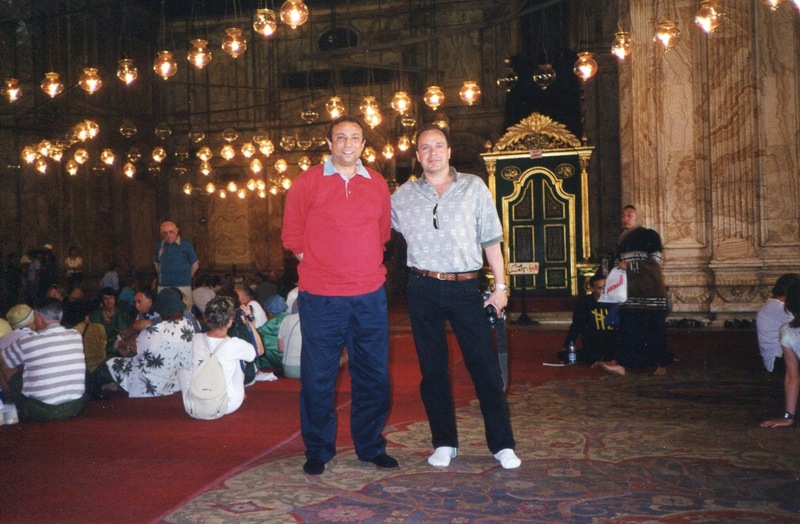 Perhaps even more impressive was the welcoming coolness inside the temple from the 40+ celsius temperature outside. 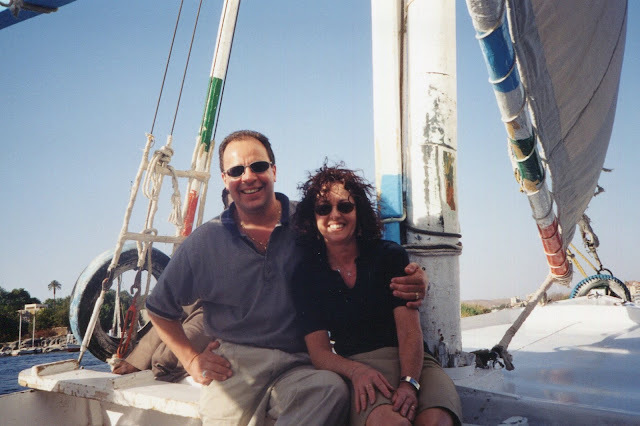 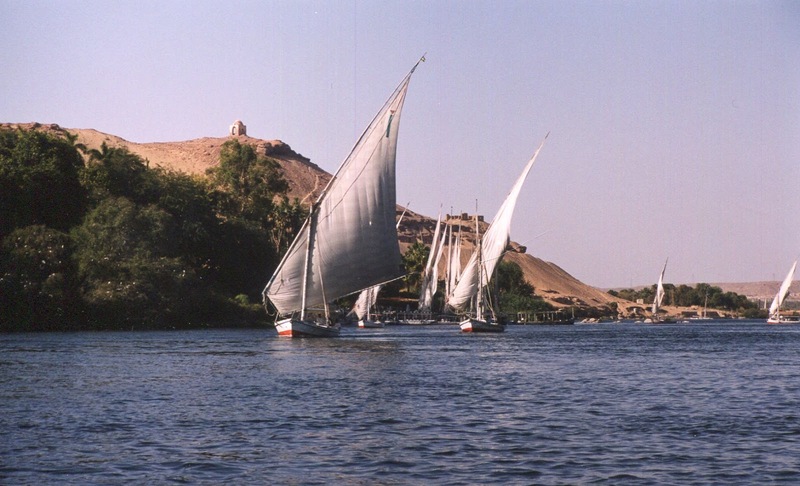 By far the prettiest and coolest way to see Egypt is by cruising along the Nile. 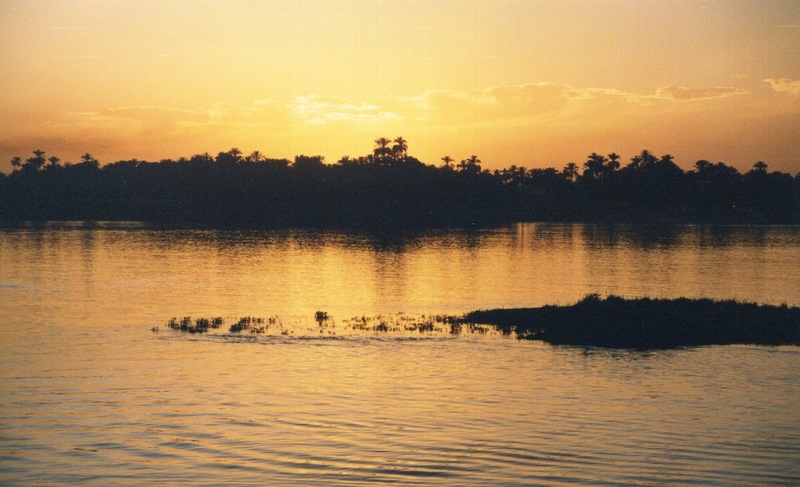 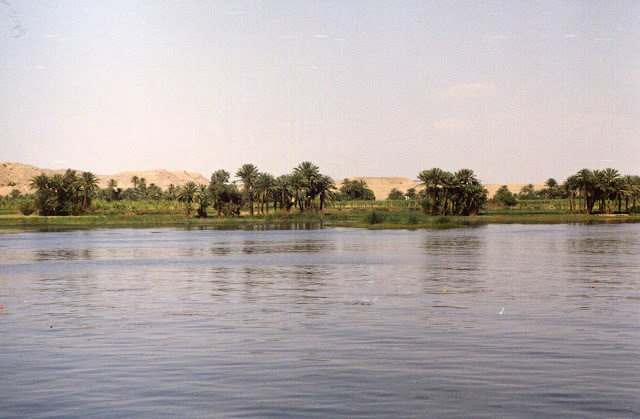 Originating in the Great Lakes region of central Africa, and more than 4,000 miles in length, the Nile is the longest river in the world. 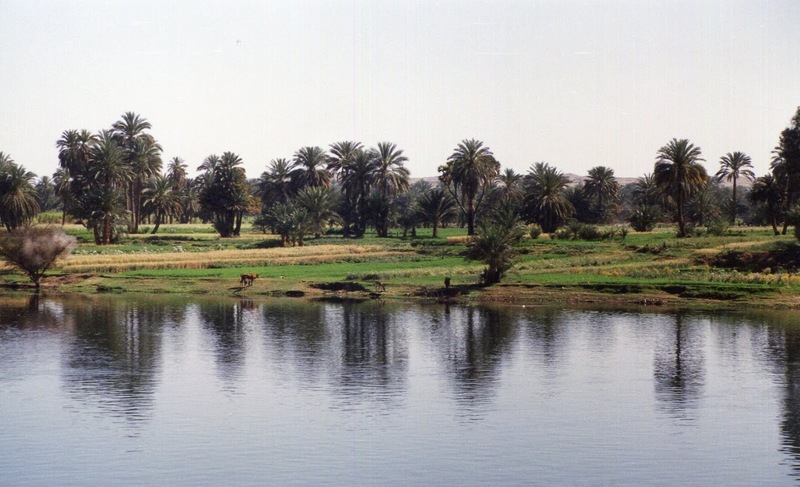 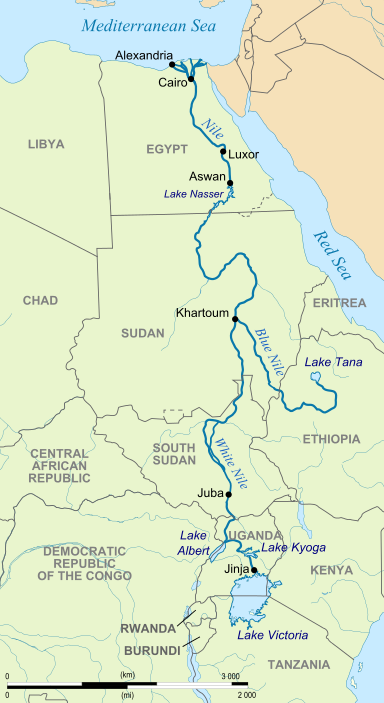 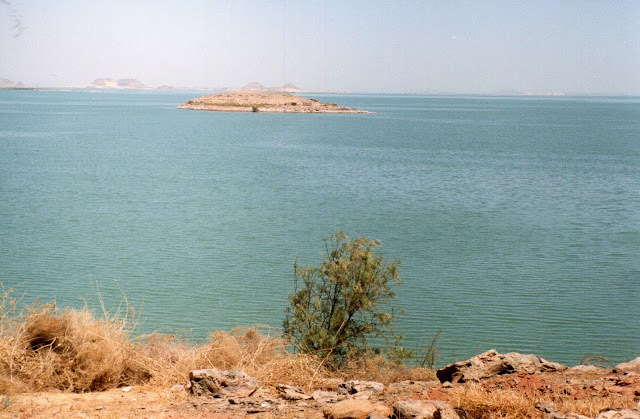 Formed by two major tributaries,the White & Blue Nile rivers, it drains the watersheds of 11 countries as it proceeds at a leisurely pace all the way to the Mediterranean Sea. Saying goodbye to Aswan we settled onto the deck of our mini-cruise ship the “Amy” and for the next three days proceeded at a leisurely pace down the Nile. 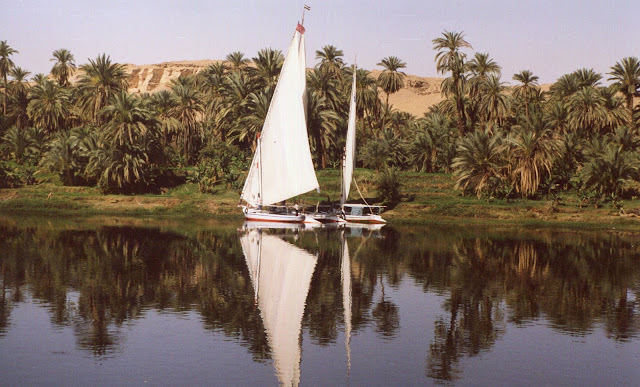 Free from all distractions and able at last to simply relax, the various members of the group staked out their positions around the boat and settled in with their books, cards, letter writing, drawing materials, and other solitary amusements. 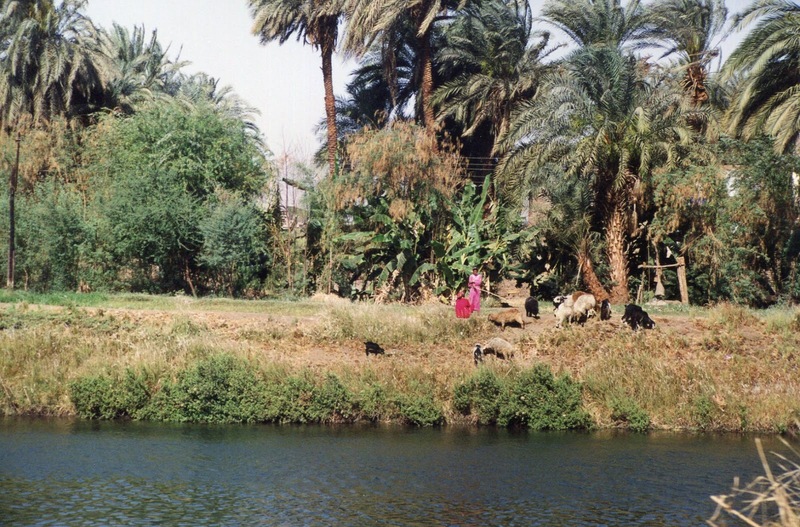 Enjoying the lush tropical scenery along the river’s edge, photographing scenes of passing village life and farmers tending their fields of cotton & grain, while drinking Stella beer and basking in the desert heat, there wasn’t much more anyone could ask for and, as for myself, I was content to get out my sketchbook and do a little drawing. 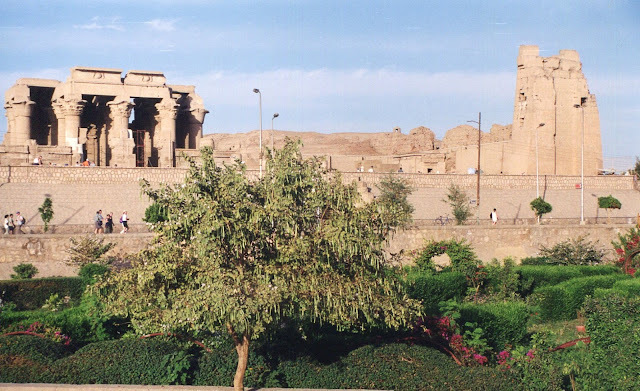 Stopped along the way to check out a few notable temple ruins including the temple of Kom Ombo and the temple of Horus at Edfu. 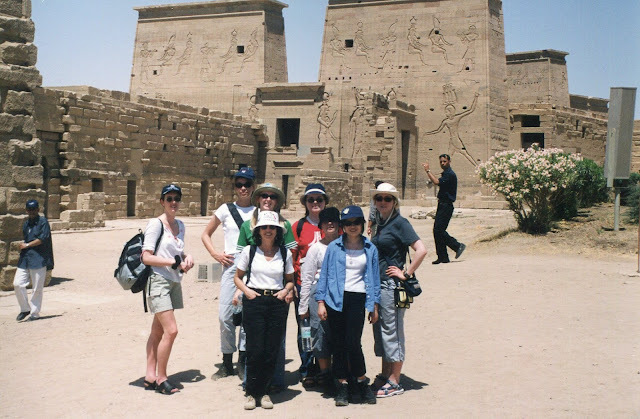 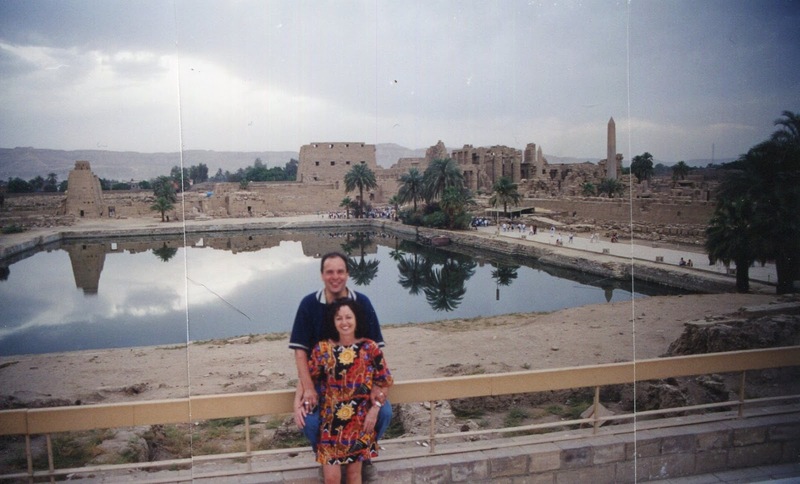 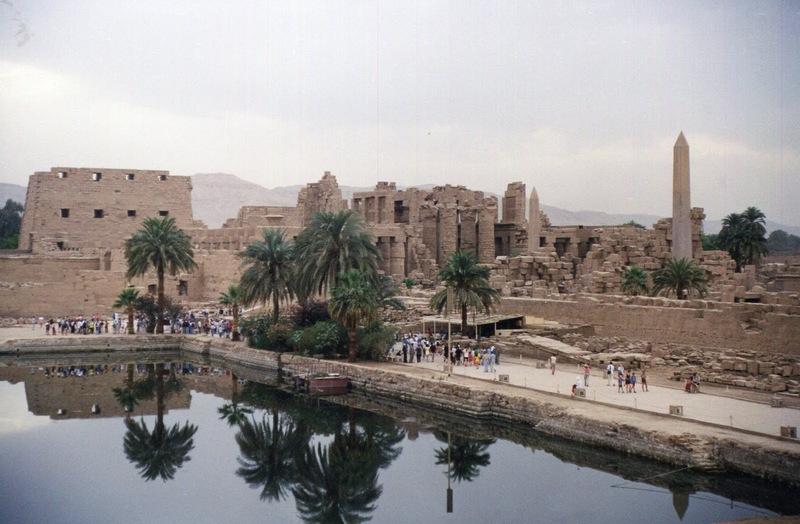 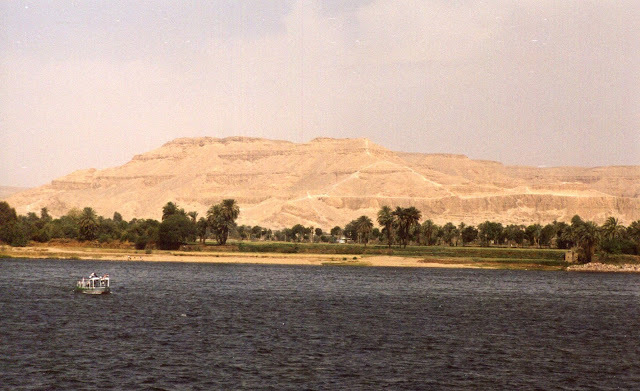 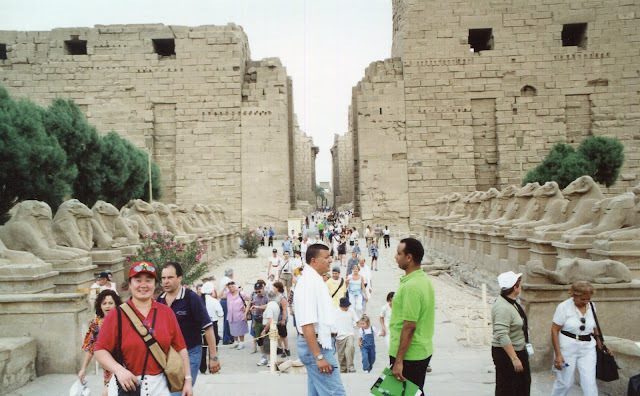 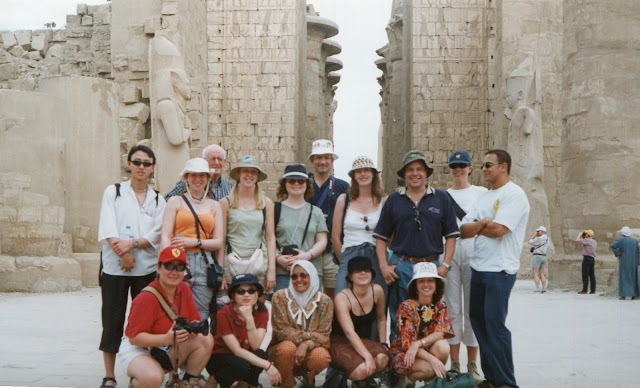 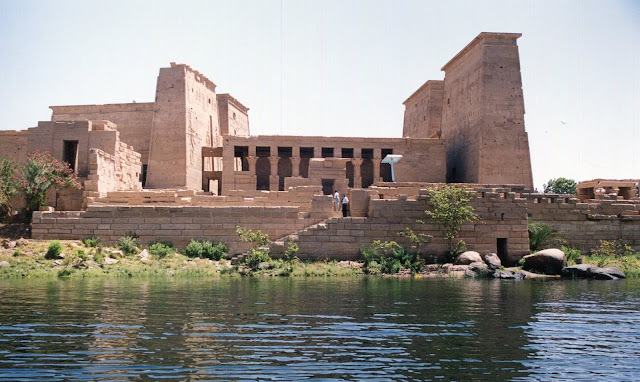 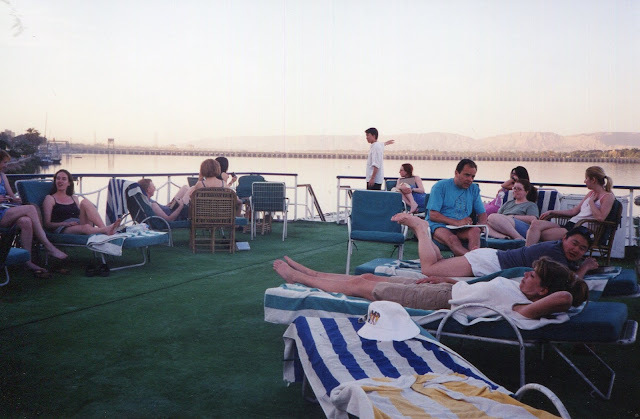 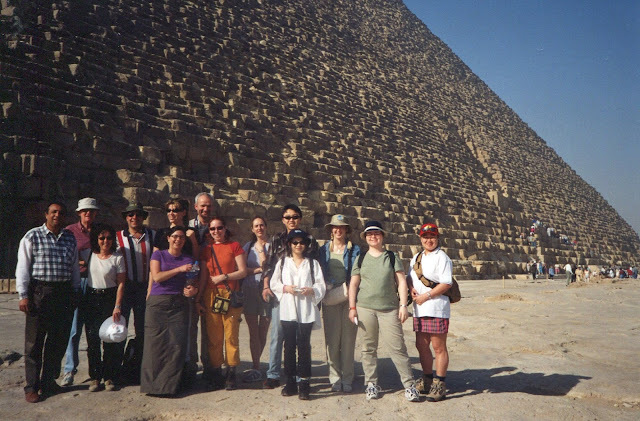 Our Nile cruise ended at Luxor, the location of many vast temple complexes and the starting point of the Valley of Kings. 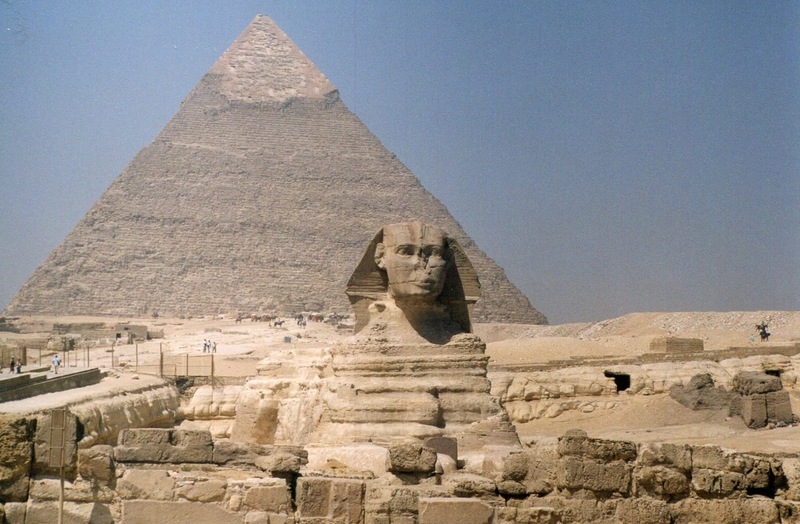 An area filled with monuments to greatness for those who survived and so many tales of treachery for those who didn’t. 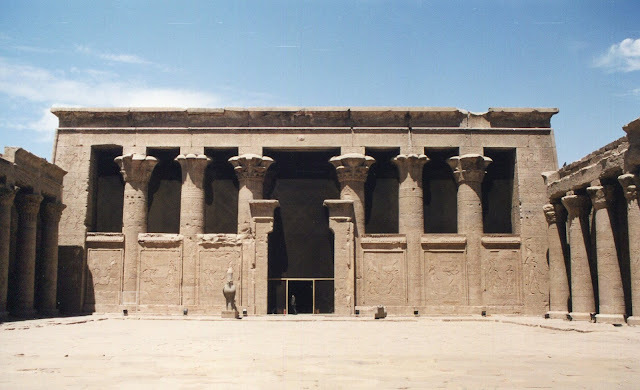 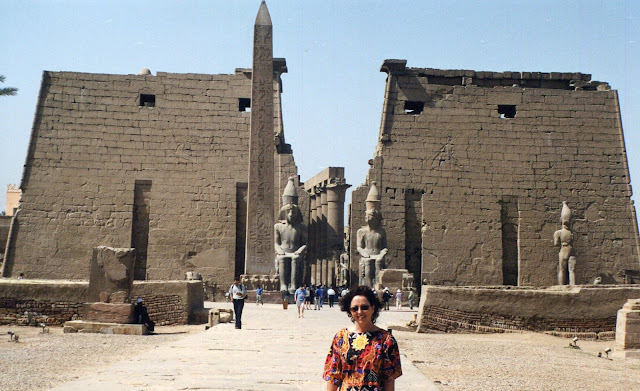 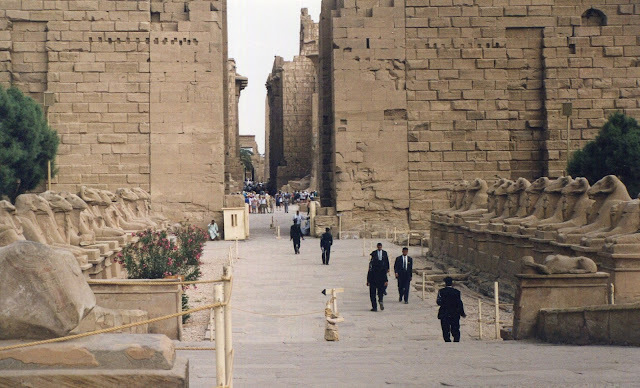 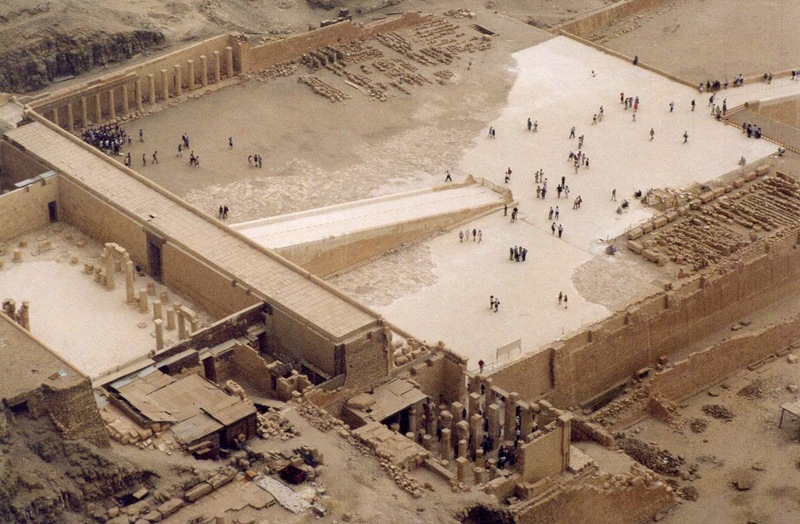 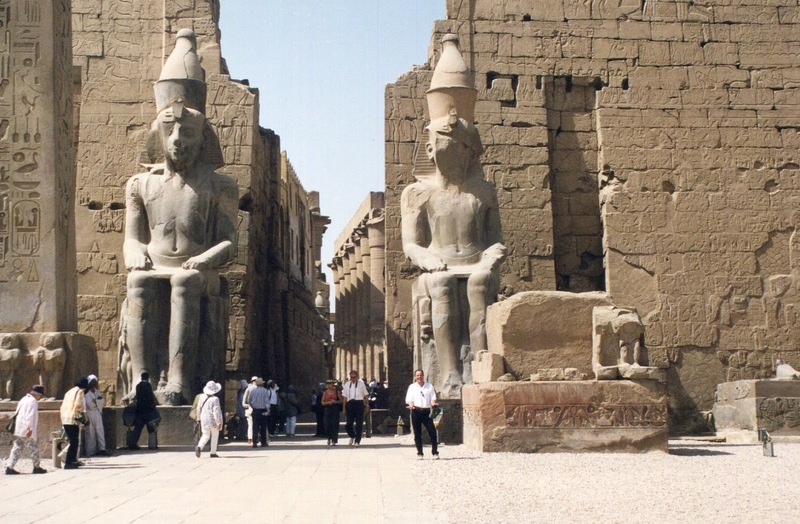 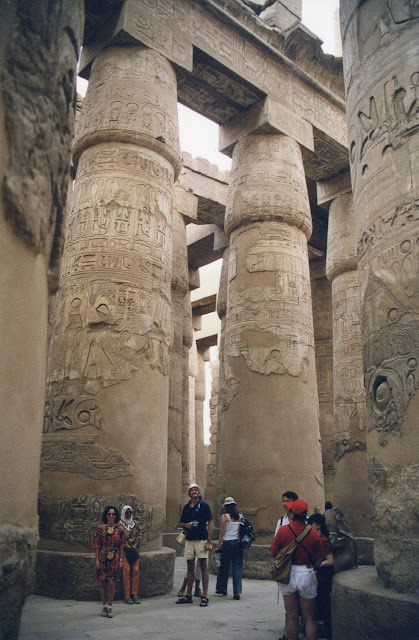 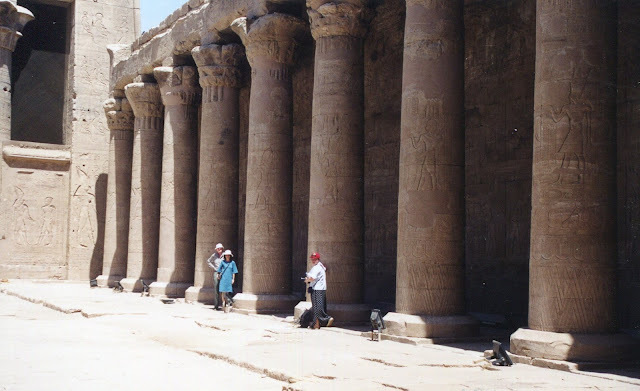 The Luxor temple and the amazing Karnak temple complex have been continuously expanded on by succeeding pharaohs until it exceeds, even to this day, the size of the Cathedral in Seville, St. Peter’s in Rome, and St. Paul’s in London combined. 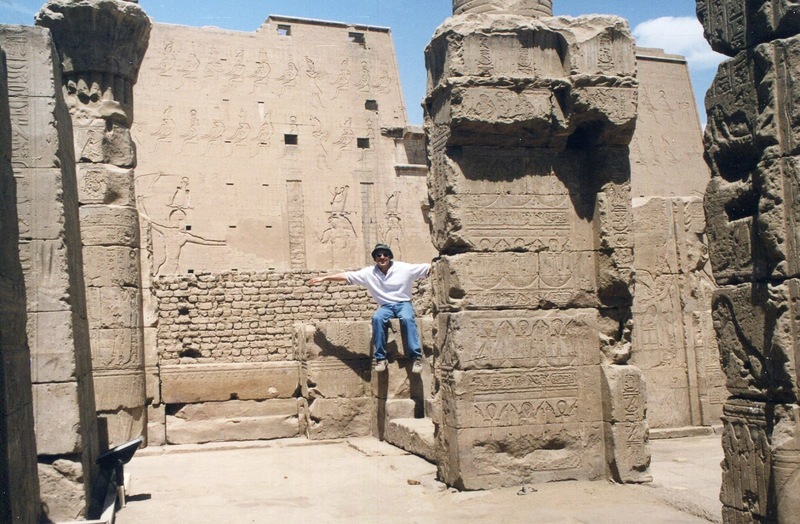 Of course in Luxor there were more statues of Ramses 2, who it would appear, was by far the most popular man in Egypt. 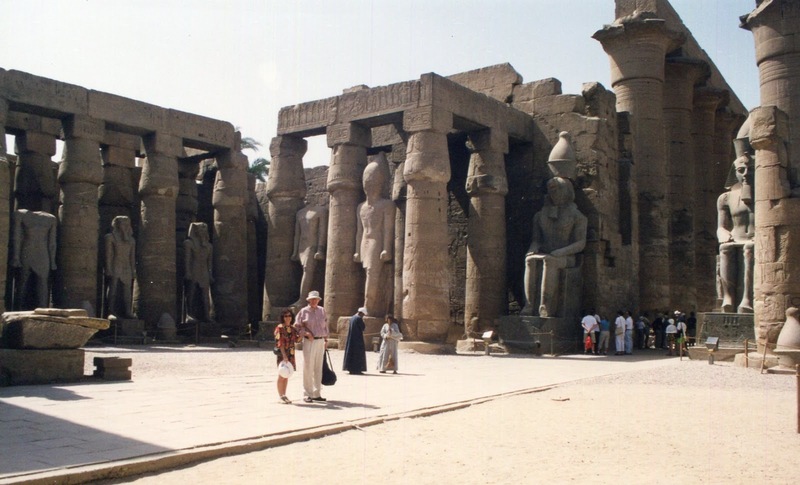 Why so many statues? 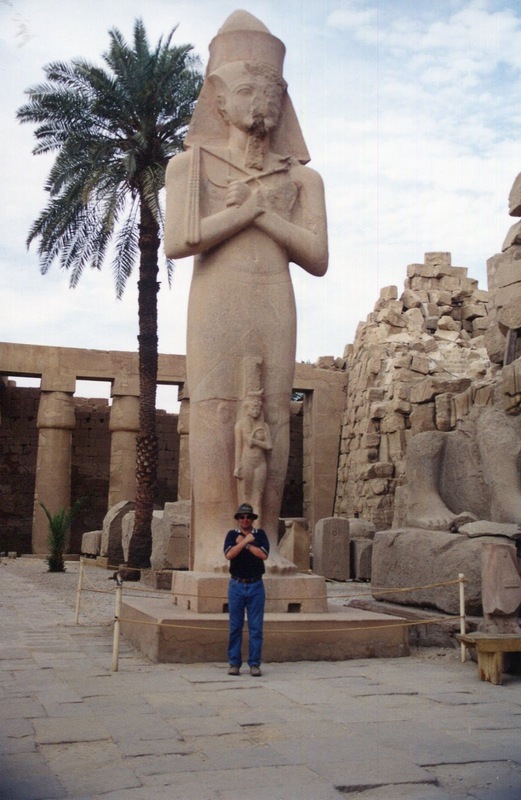 According to ancient religion, in order to come back from the dead it was believed you had to have at least one complete statue of yourself somewhere that clearly identified who you were. 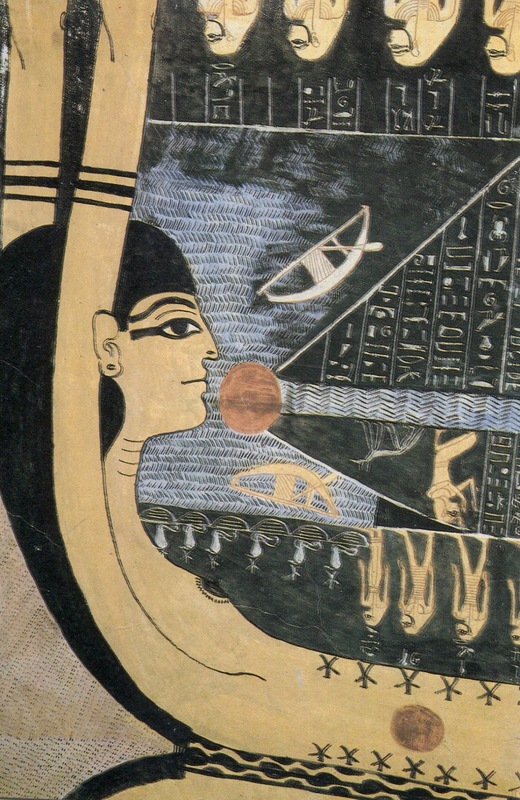 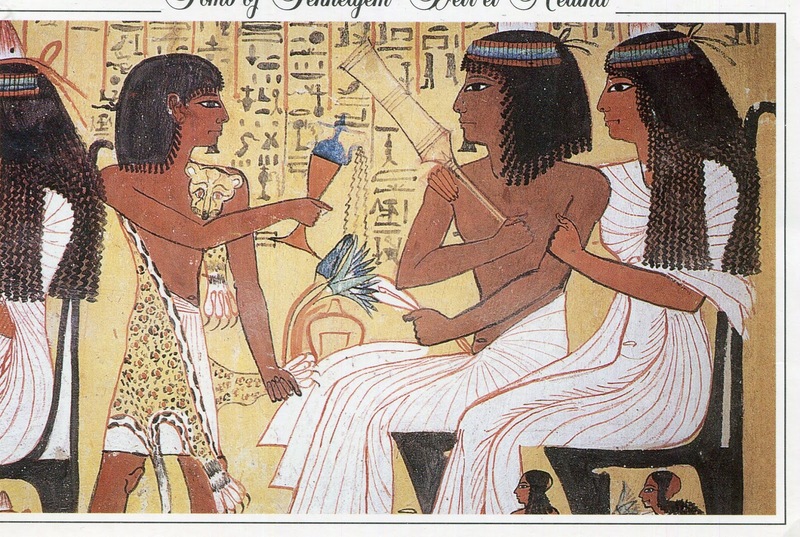 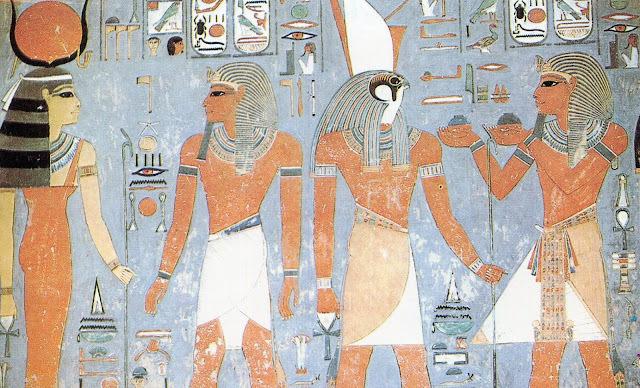 This hieroglyphic name tag is called a cartouche. 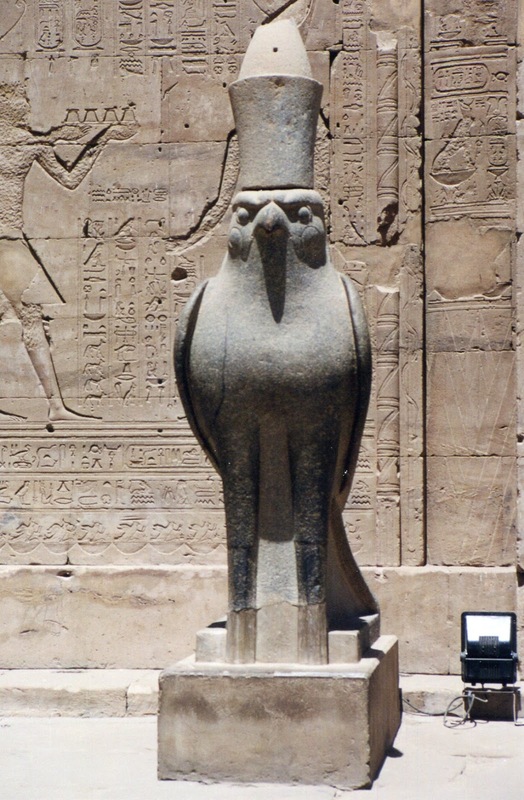 To foil your plans for eternity, all one of your successors and/or enemies had to do was break off the nose on your statue and chisel away the cartouche. 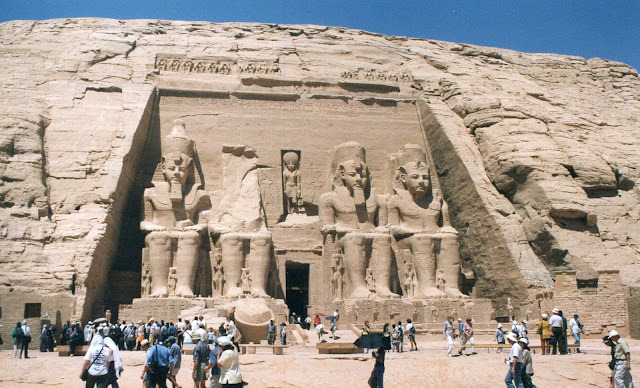 Hence there is a lot of disfigured statuary everywhere, and powerful pharaohs like Ramses had to put a lot of effort into making copies of themselves to ensure at least one survived intact until judgment day. 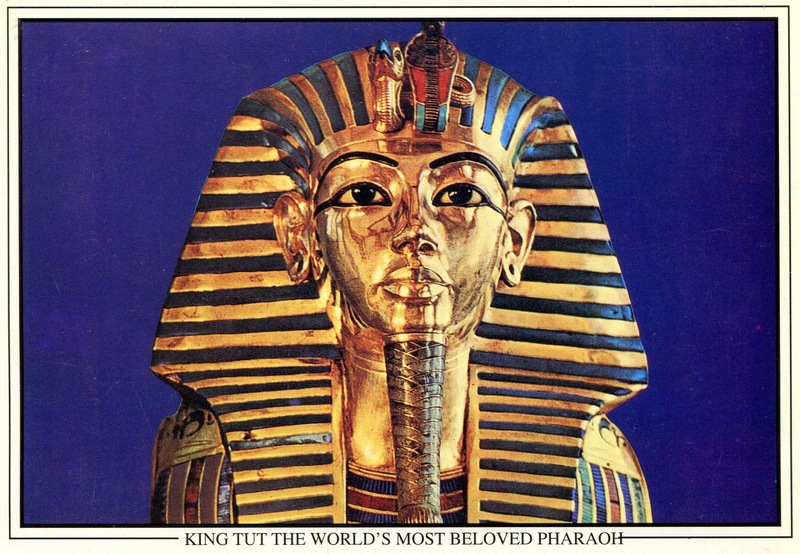 How easy it is to forget these rulers were only human despite their divine pretensions. 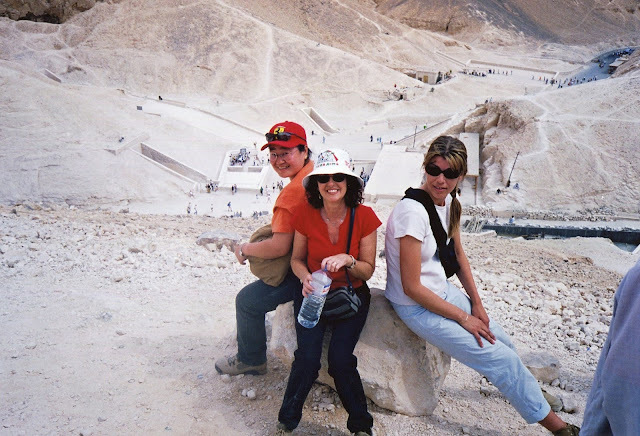 A particularly interesting story surrounds the rise of Hatshepsut, the first female pharaoh who kept her own nephew off the throne while she was alive and, with a reckless disregard for the rules, fell in love with and secretly married her palace architect. 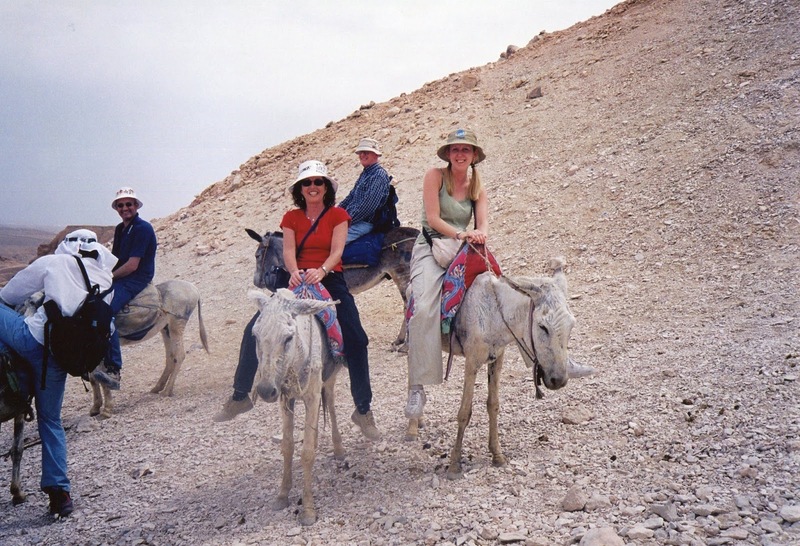 The next morning we were up extra early to try and beat the incredible heat of the Sahara as we saddled up our donkeys and rode off into the hills to explore the hidden tombs of the pharaohs that had been carved out of the mountains themselves. 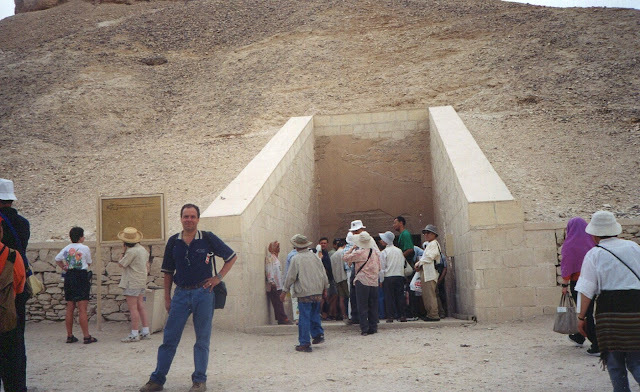 Having given up on building pyramids to safeguard themselves and all their goods & treasures for the afterlife, later pharaohs thought these tombs would be a safer bet against the grave robbers. 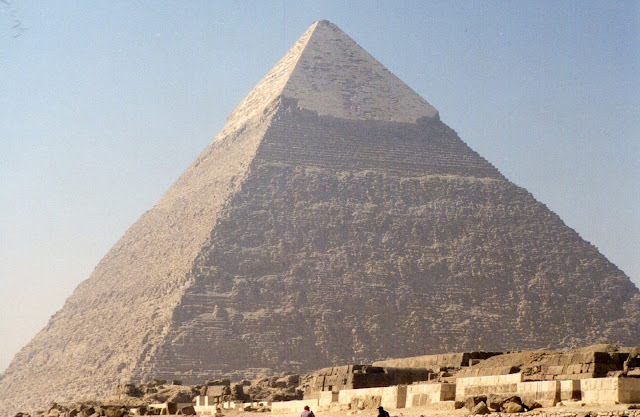 Of course they were wrong, since the robbers, builders and artisans were all in cahoots together, but it kept a lot people gainfully employed. 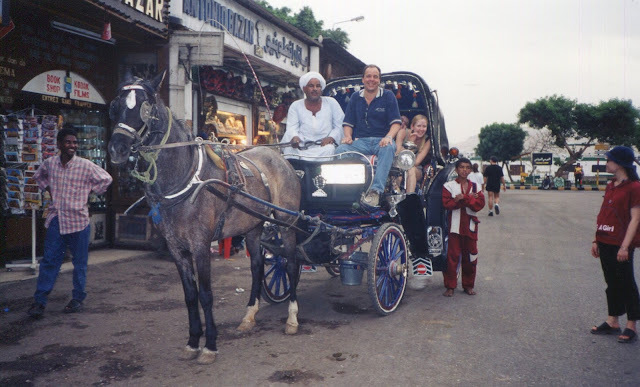 It was an incongruous sight to see a group of well educated, technologically able adults with computers, email addresses and cell phones in another world, using a form of transport as timeless as the villages they passed through. 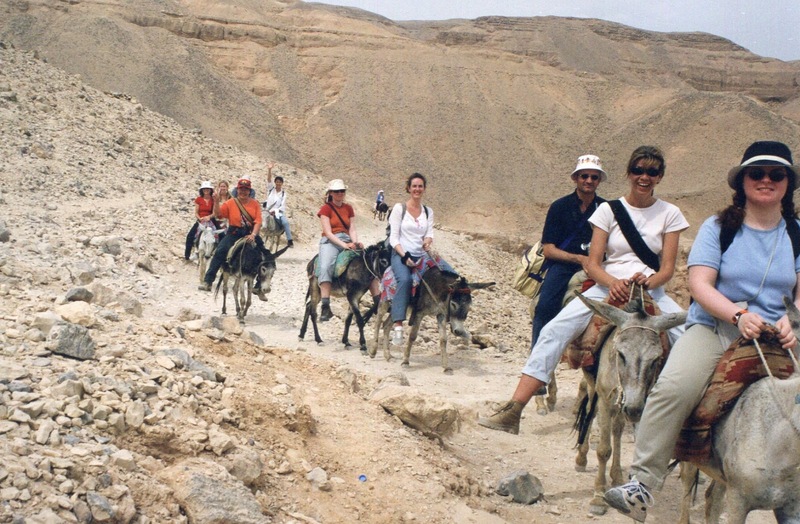 But it was effective and perfectly suited for getting around the treacherous terrain of the area. 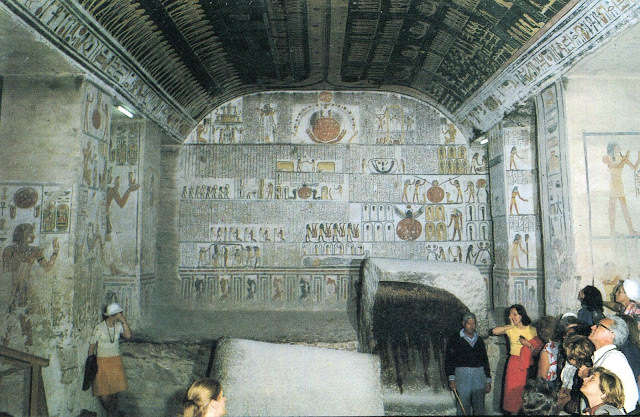 Would any of our modern inventions ever last as long as the incredibly preserved tombs we visited and whose painted walls were as brilliantly coloured today, as they were thousands of years before? One of the main reasons all the mummies, painted tombs, and other ancient artifacts have lasted so long in Egypt is because of the climate. Always hot and dry, with temperatures between 35 – 50 degrees Celsius, and hardly ever any rain, nothing ever gets a chance to rot or decay. Coming from Vancouver it was hard to imagine a land without rain. 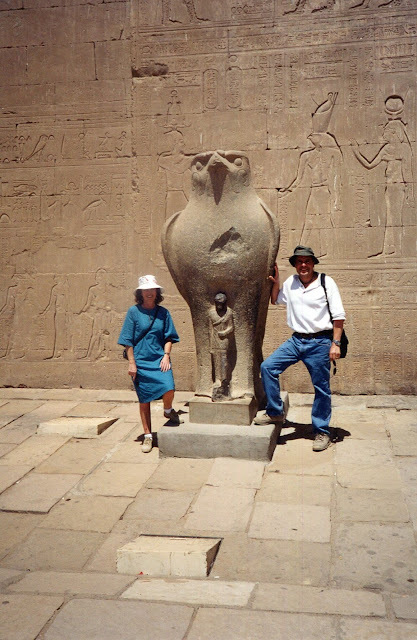 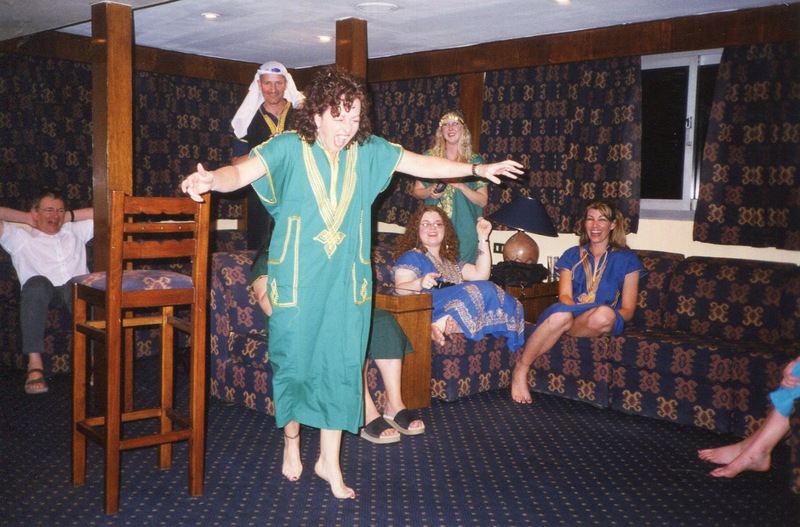 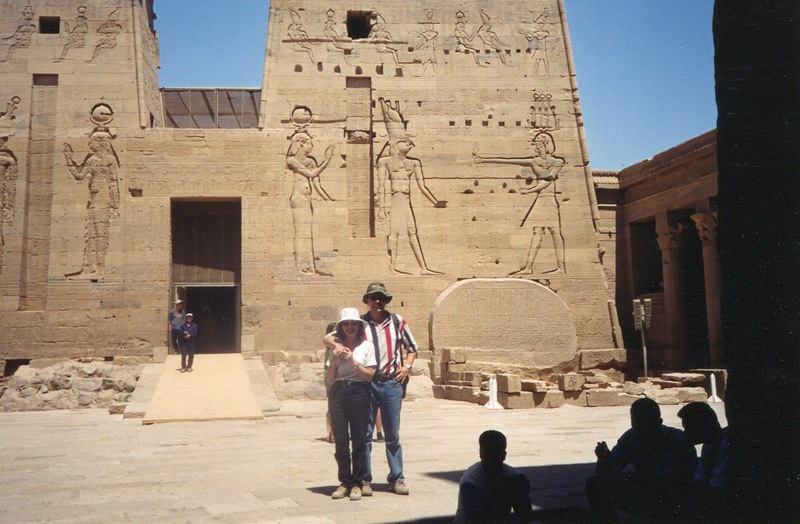 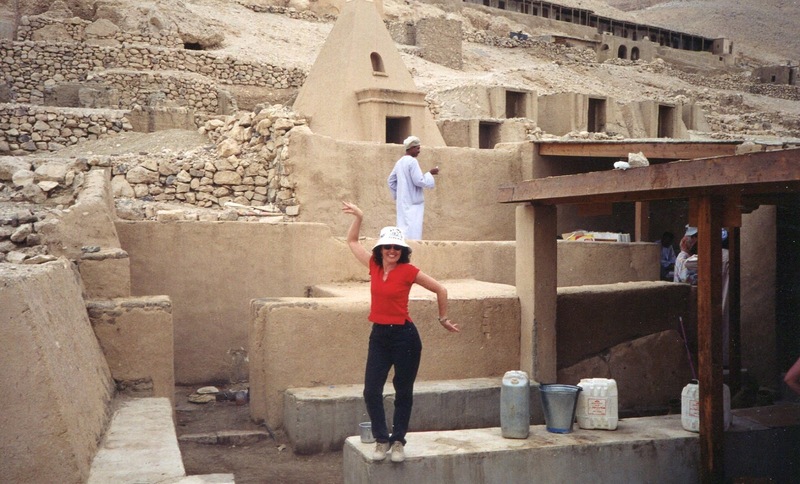 For example one night in Luxor there was a freak thunderstorm with perhaps a 20-minute downpour of rain. 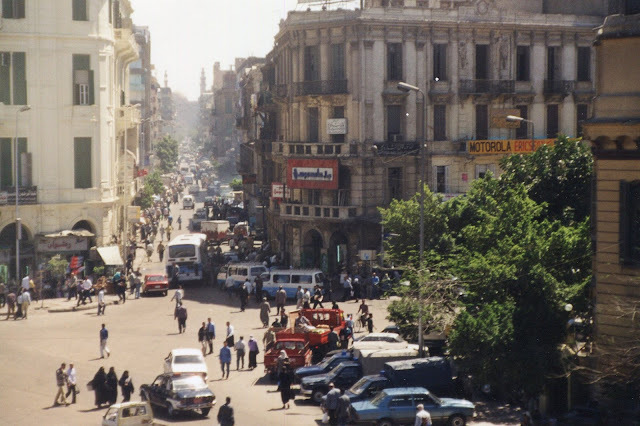 As soon as the rain started, the city began to roar with the sound of all the people rushing out into the streets to shout and cheer. 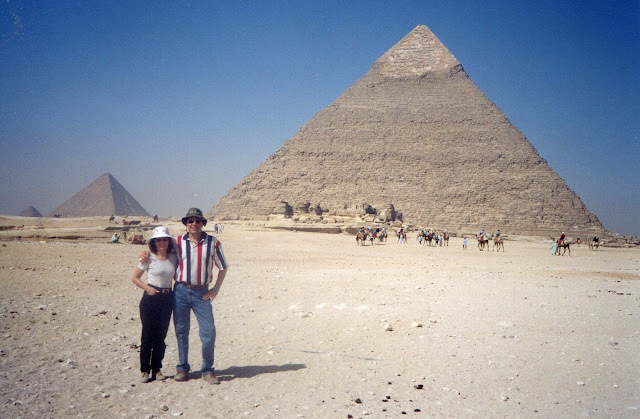 Apparently it hadn’t rained for over three years, and this was an occasion to celebrate. 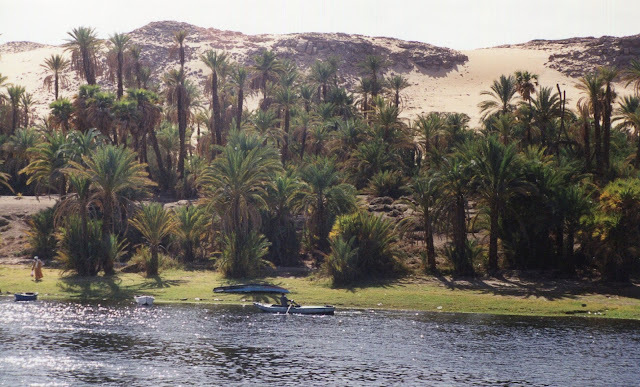 Very strange and it made us realize how lucky we were to live in a land that had no shortage of water. 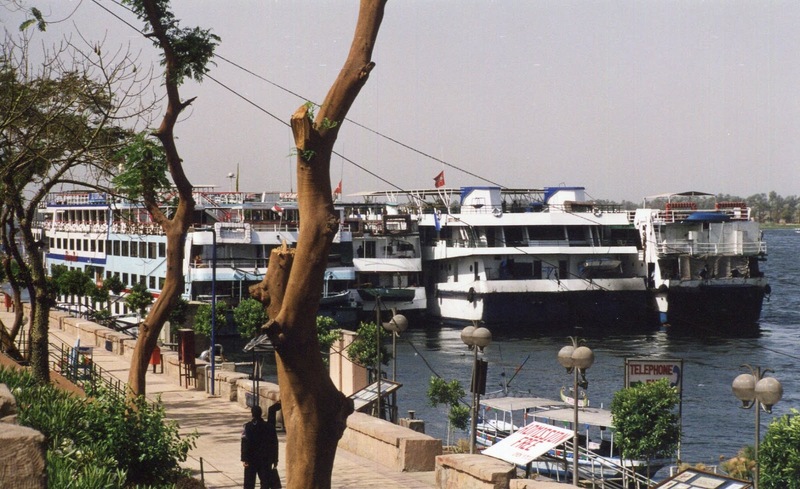 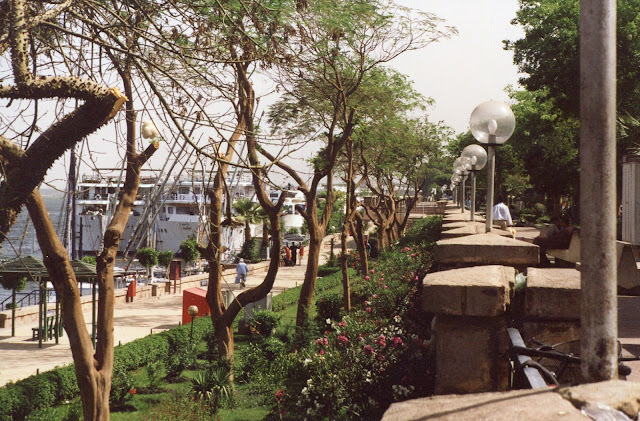 Though the giant cruise ships go back and forth between Aswan and Luxor, it is along the magnificent river walk and boulevards of Luxor where they seem to congregate the most. Docked not just end to end, but side by side as well between three to five ships wide, we walked past a continuous line of these river cruisers that stretched for almost three kilometers. 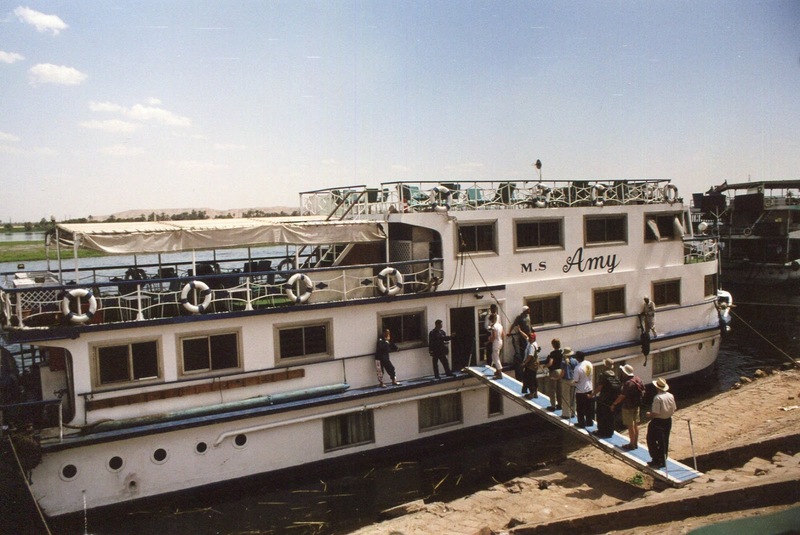 After two weeks in the desert heat and cruising along the bilharzia-infected Nile, we were getting desperate for a swim in clean water. 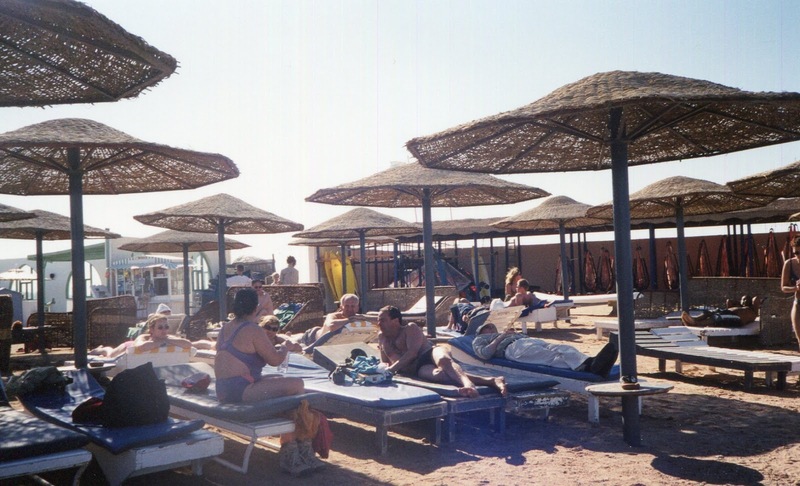 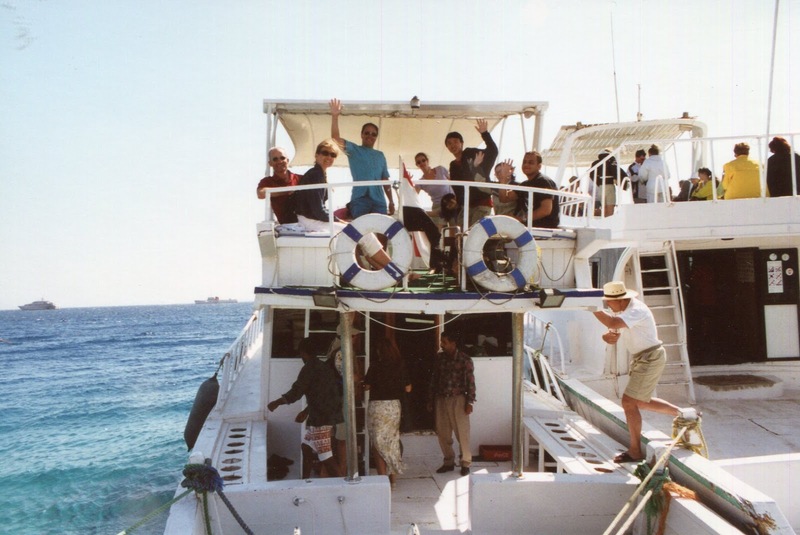 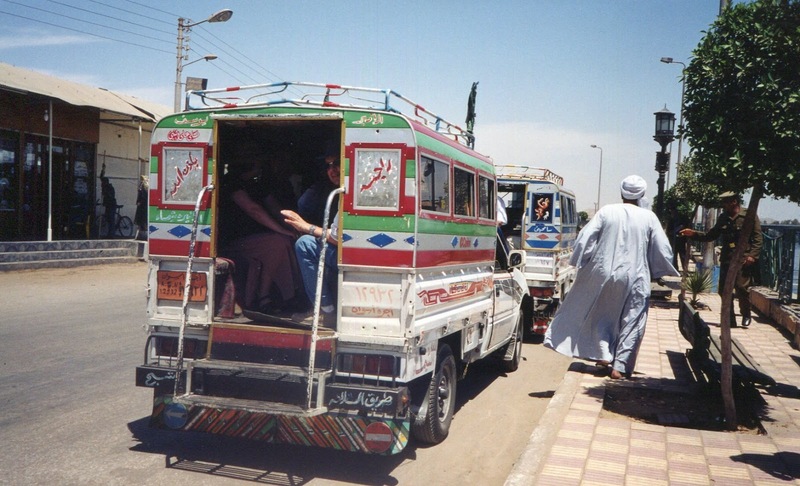 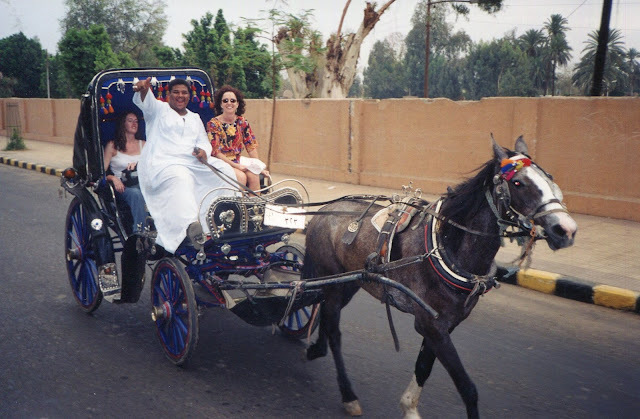 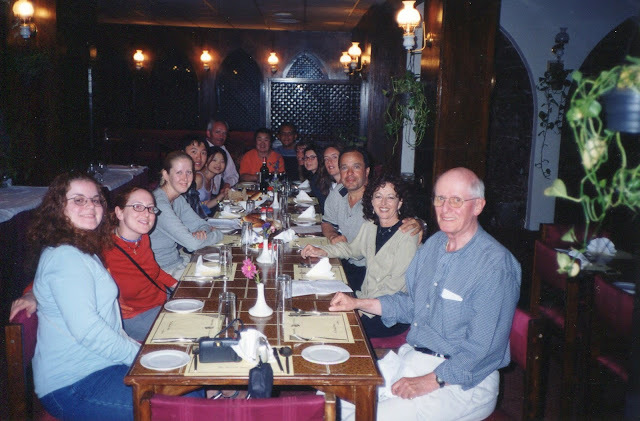 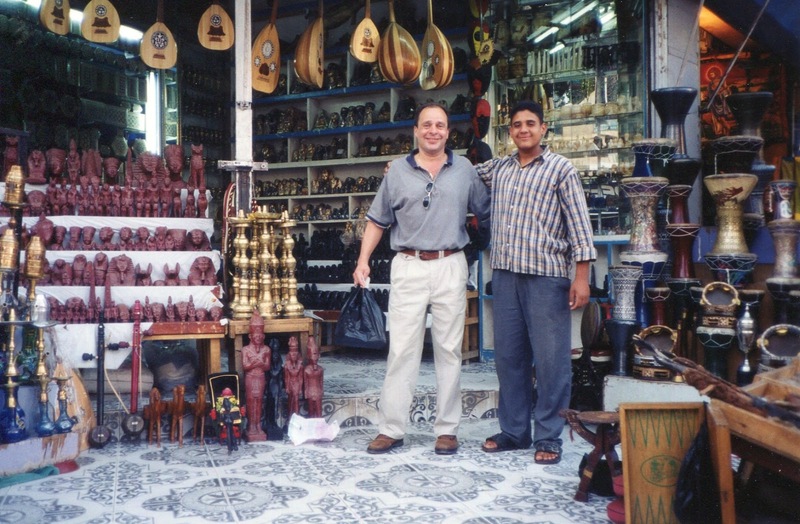 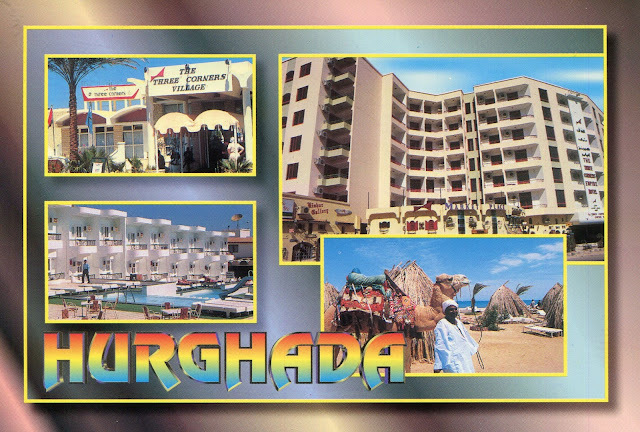 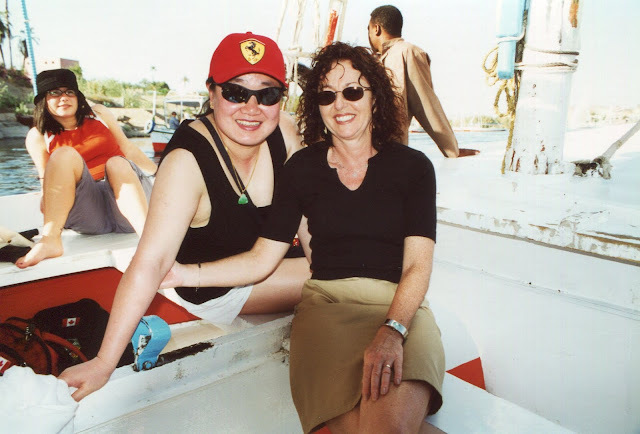 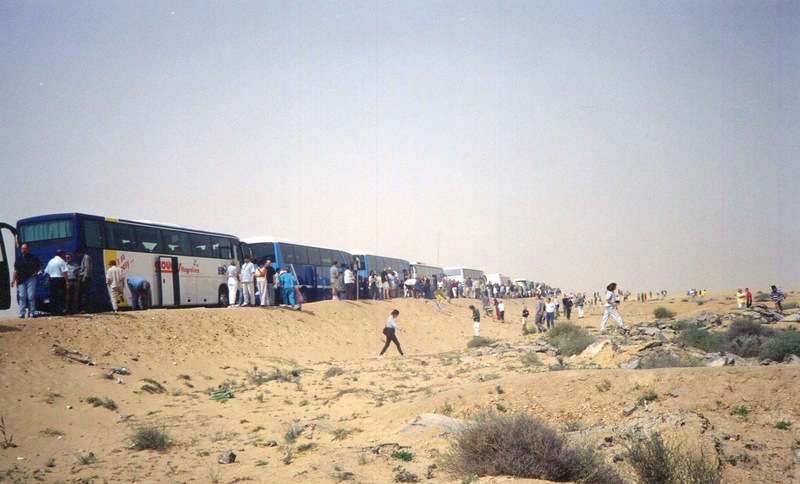 Luckily the last leg of our journey was to the resort town of Hurghada, located on the Red Sea. 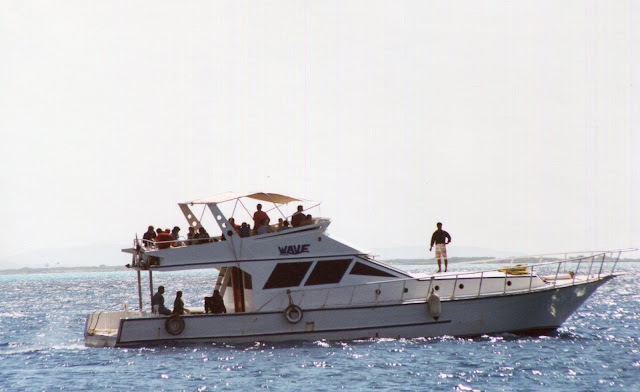 Getting its name from the miles of coral reefs that cause the ocean to look red in the morning light, it was actually beautiful pale blue water with clear visibility right to its sandy bottom. Here we got a chance to go snorkeling in what is one of the world’s best locations. An amazing diversity of fish and various forms of sea-life live among the coral in spite of the rather cavalier way they are protected in the face of so much new hotel construction. On our way back to Cairo we had to once again form up in a police escorted convoy for a long journey up the coast and through the desert with only the occasional pit stop. The Egyptian government takes it tourism business very seriously and, to thwart any further terrorist attacks, they ensure everyone is well protected. 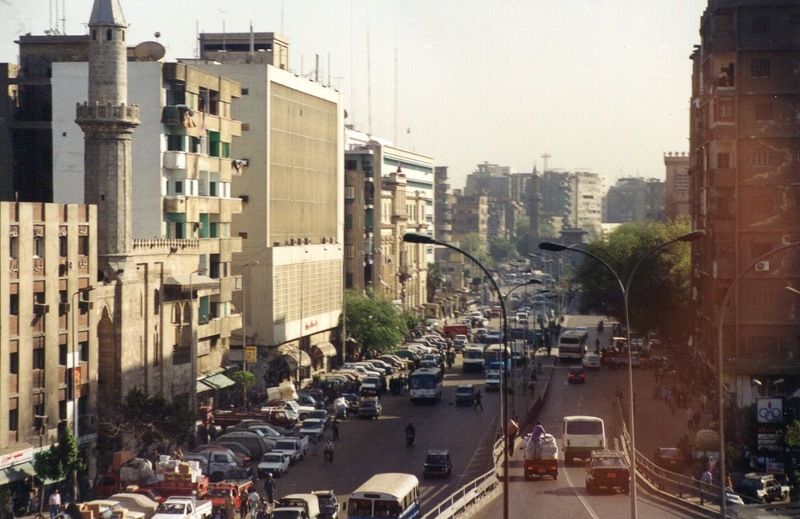 We arrived safe and sound back at our hotel where once again we were surrounded by the chaos of the city. 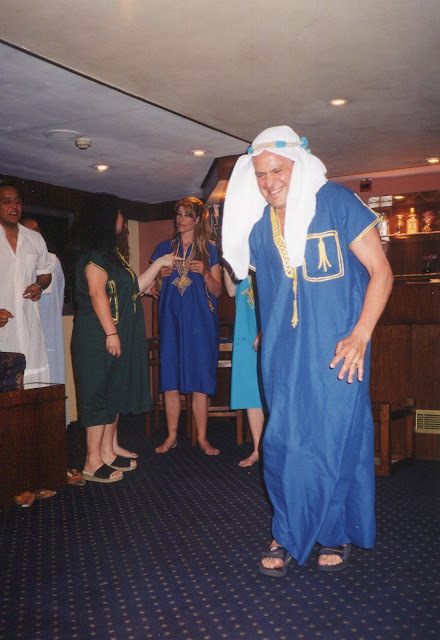 Enjoyed a farewell dinner with our tour group all dressed in traditional galabiyyas and, after exchanging email addresses and affectionate hugs, said goodbye to the Land of the Pharaohs.